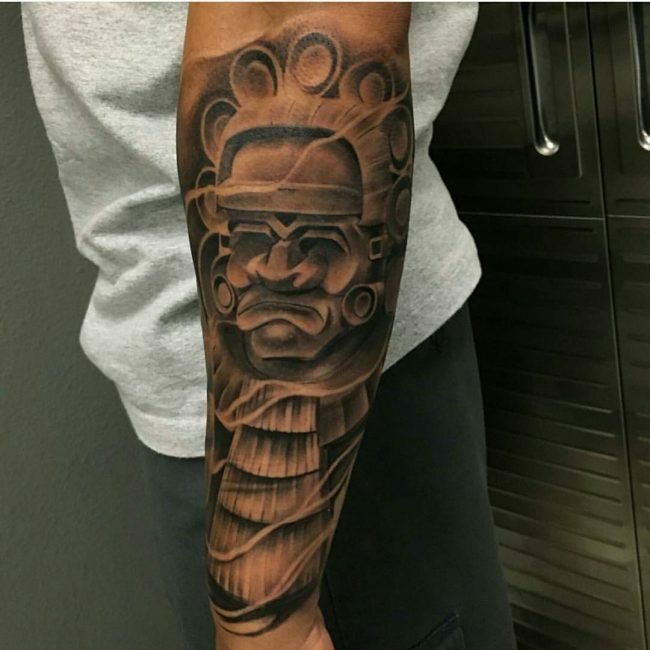 Tattoos have been there for many centuries and almost every tribe has a tattoo or two to associate with. 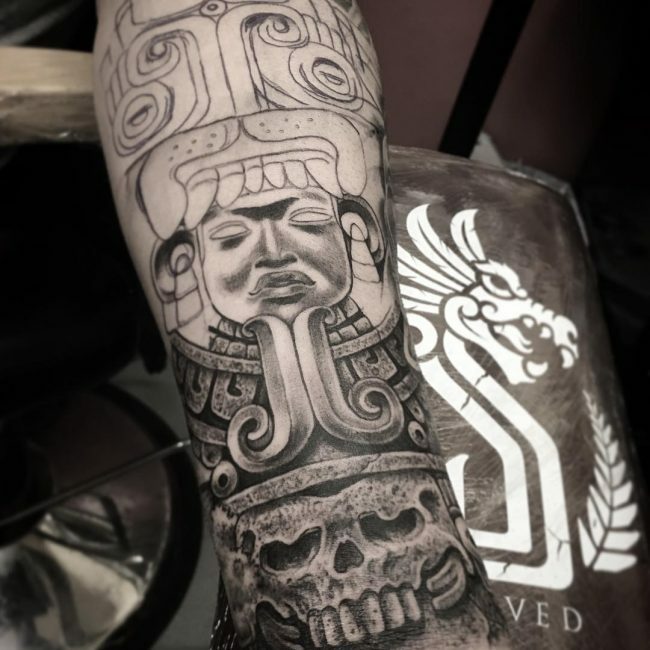 Such is the case for the Mexicans, who take great pride in the Aztec tattoo – a striking, provocative and distinctive tattoo that still looks trendy even in the modern times. 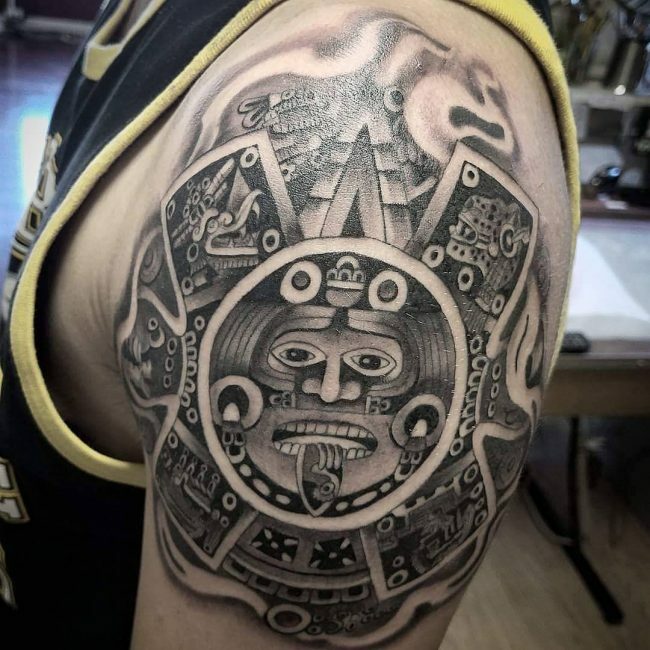 The tattoo looks great, especially when worn in combination with the beautiful Aztec clothing. 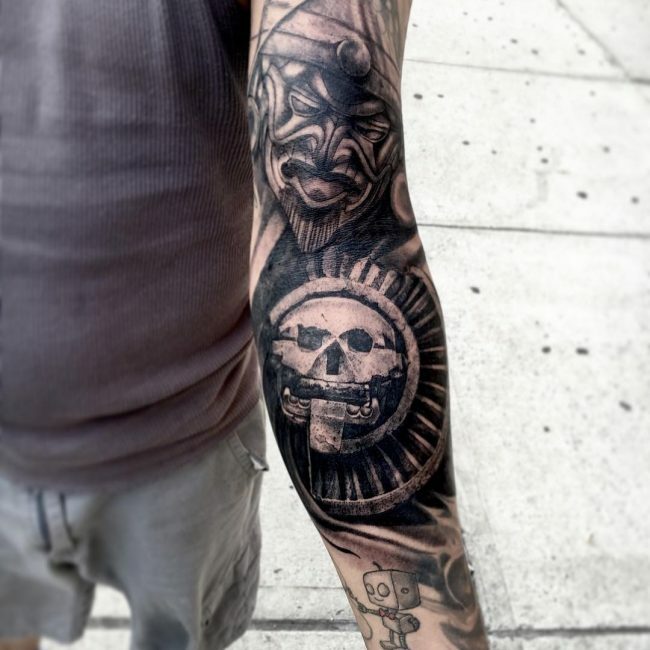 This sub-category of tattoo designs is a unique example of bodily ink that was often worn by warriors. 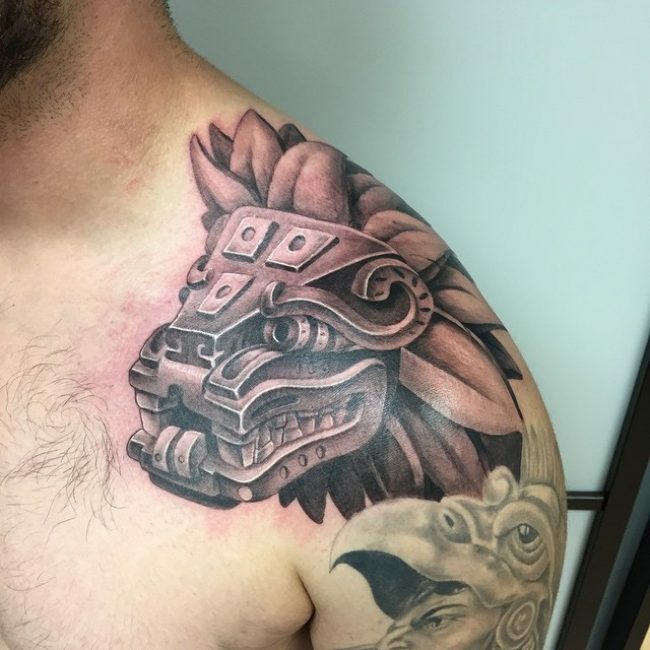 The Aztec is a versatile option in the realm of tattoos. 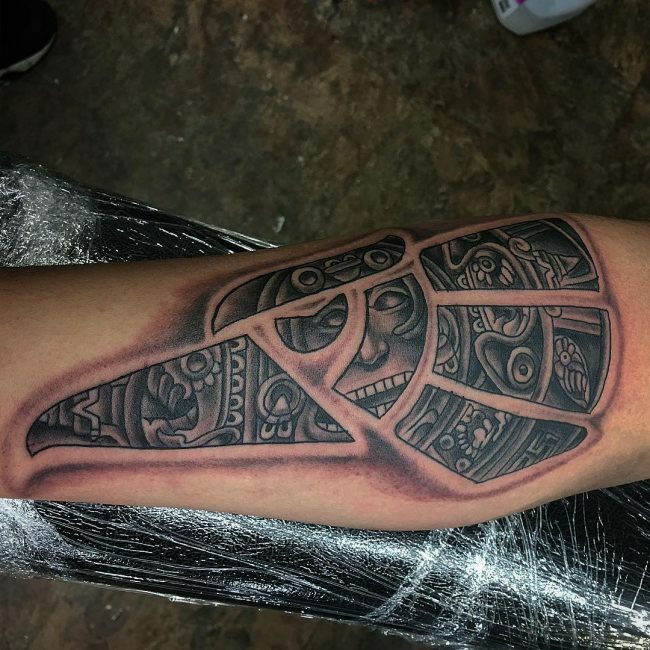 The tattoo comes in many different designs that offer multiple choices to select from. 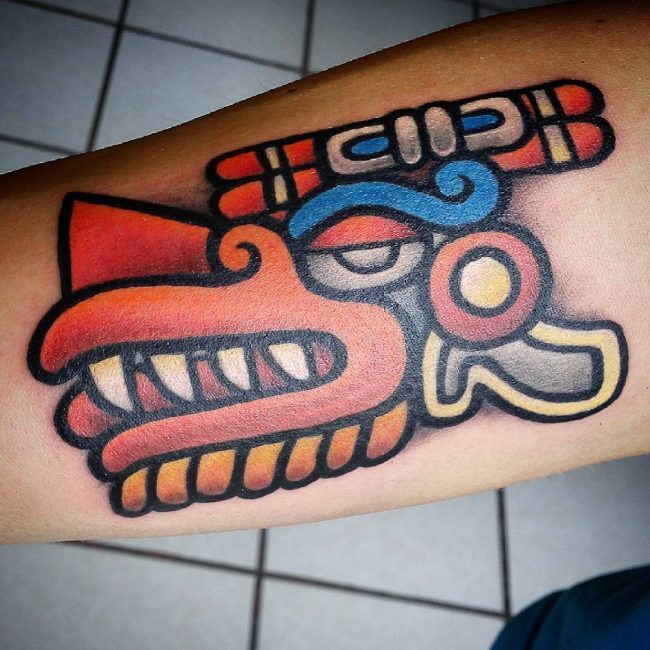 And like most tattoos, the Aztec is a tribal tattoo who’s popularity is felt across the world. 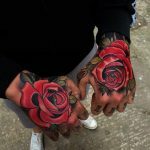 It’s truly a stunner that sports styles and accents that will definitely blow your mind. 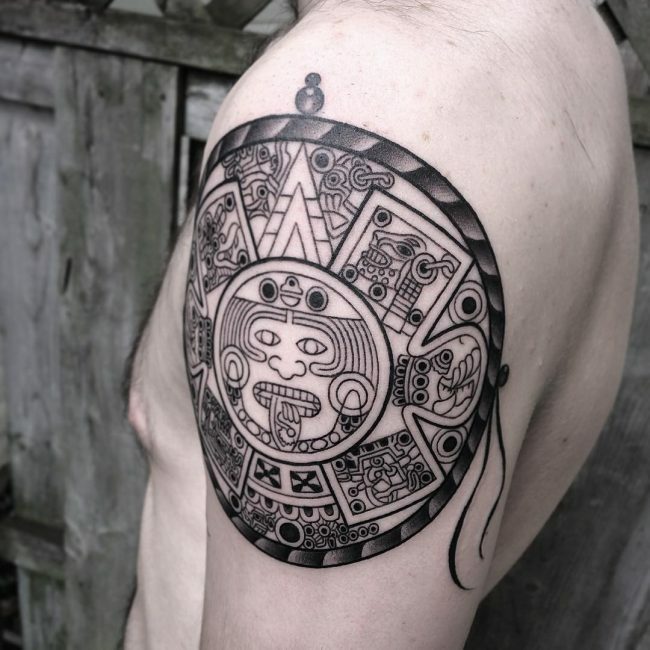 That Aztec tattoo owes its origin to the Aztecs – a magnificent tribe of people from central Mexico. 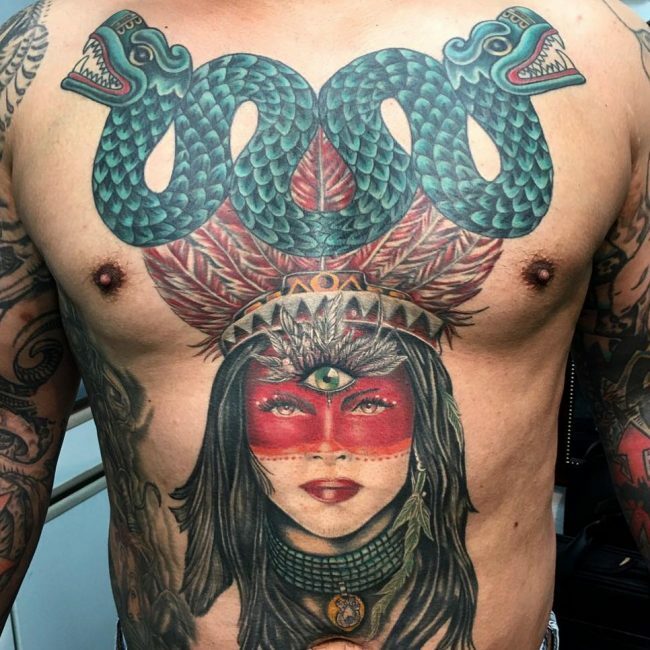 This is a tribe that practiced extensive body modification and it’s believed that the tattoo existed way back in the 12th century. 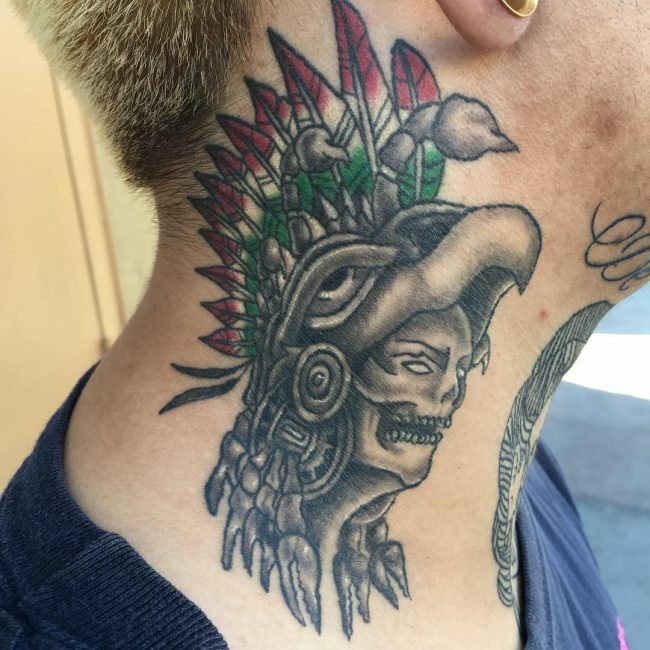 It’s a tribe full of mysteries and has been the subject of many researchers around the world. 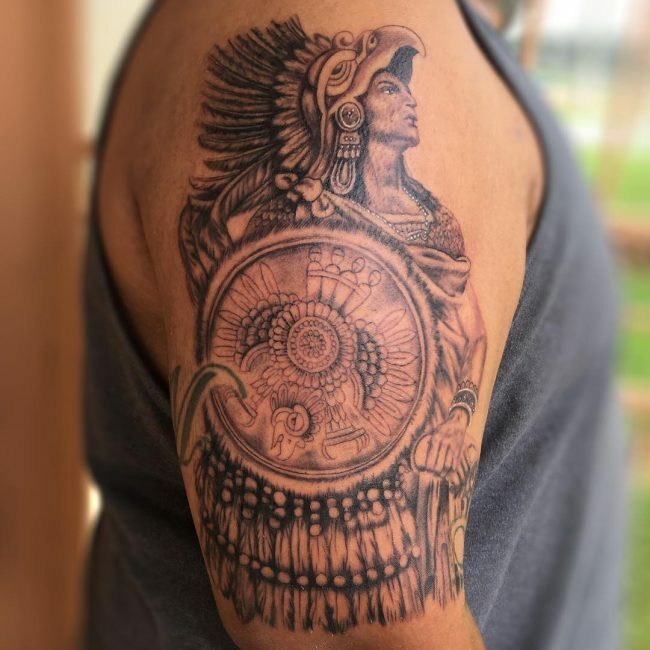 The tribe was quite advanced in its time despite the primitive tools and techniques used to make the tattoos. 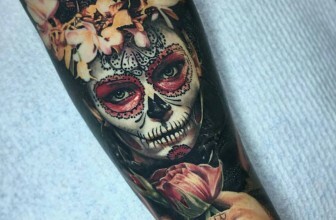 The tattoos sported intricate details and vibrant colors that equal the beauty and artwork of modern-day tattoo designs. 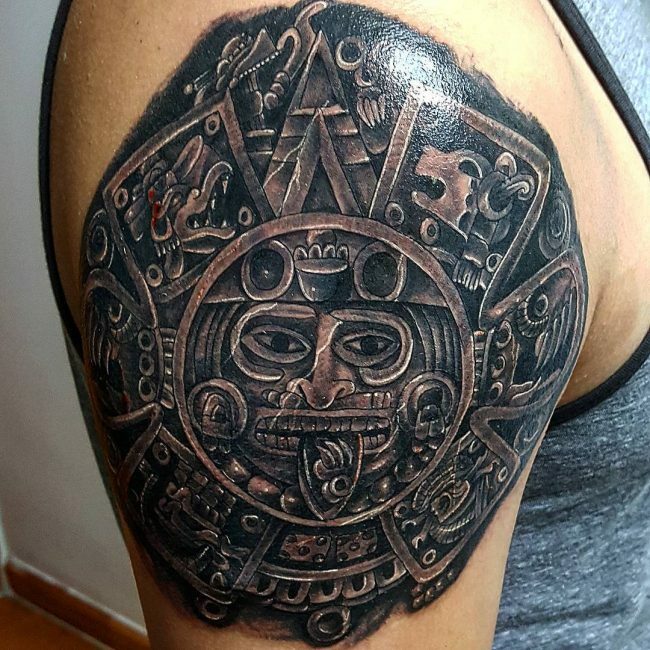 The tattoos were specially used to depict civilization and Aztec gods. 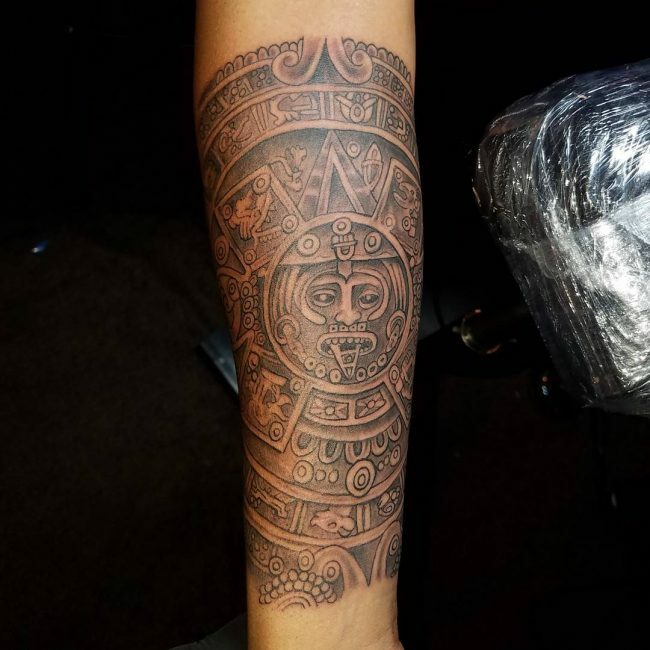 And it’s no wonder that most of the tattoos featured the face and symbols of the tribal gods. 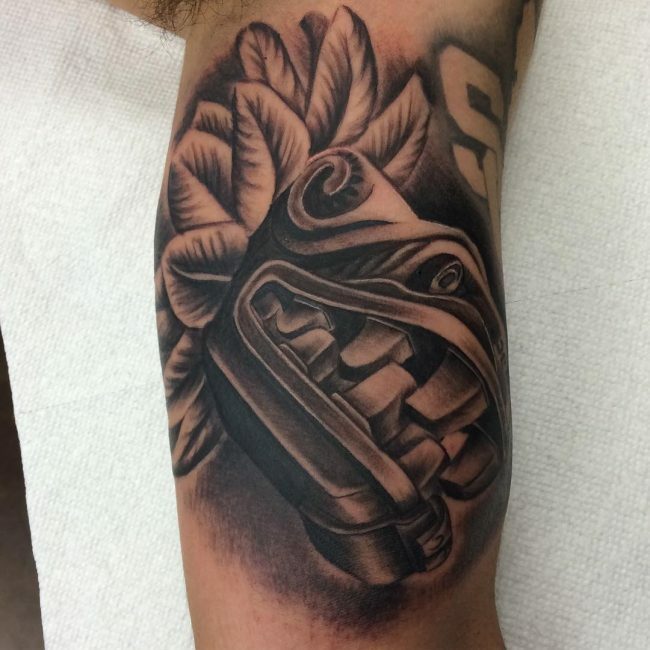 The tattoo was very important in ritual and sacrifices that included many different forms of body modification. 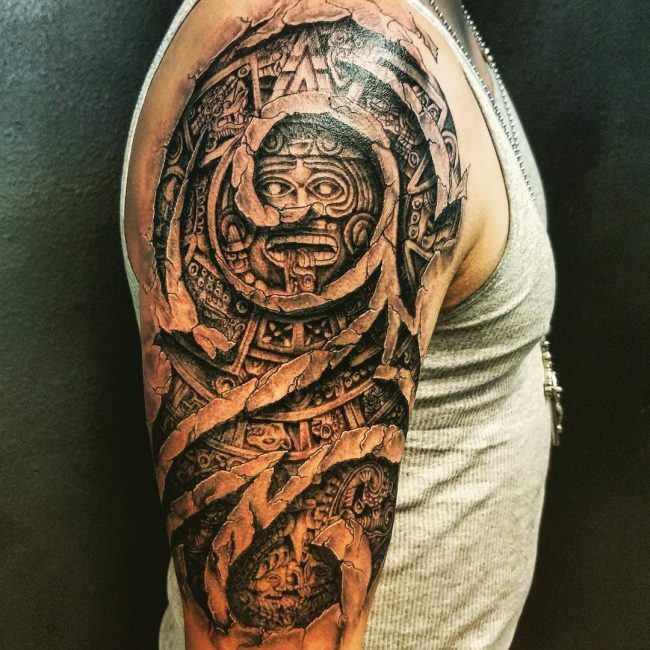 It was meant to appease the gods to work in favor of the tribe. 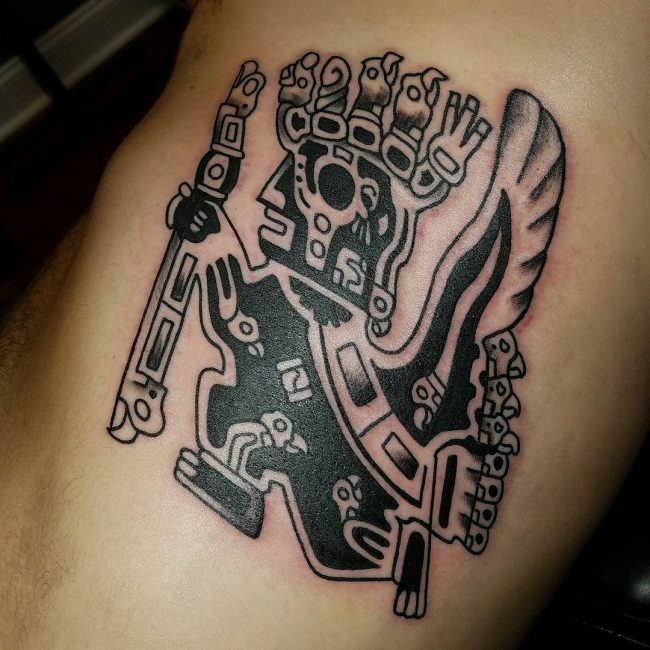 One of the most popular gods depicted in the tattoo was Uitzilopochtle and Cuauhtli. 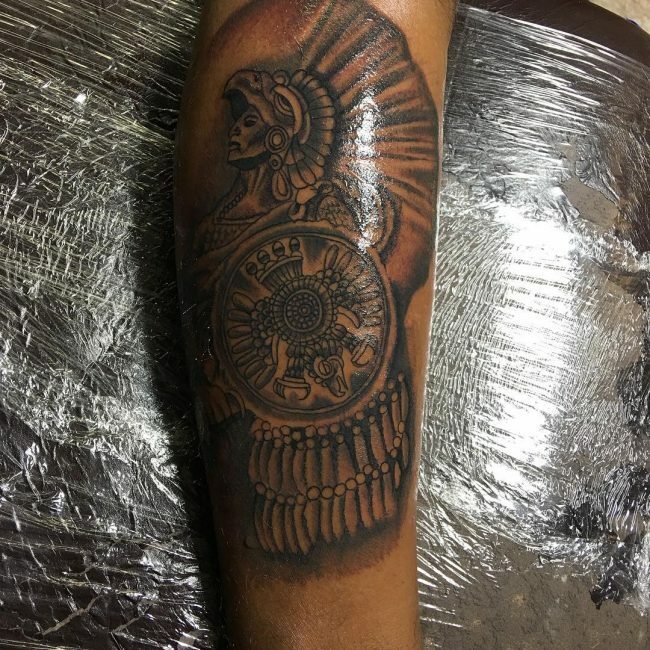 The tattoo wasn’t meant for adults only, children also wore them as a sign of honor to the gods. Each god had a special pattern that created a clear distinction. 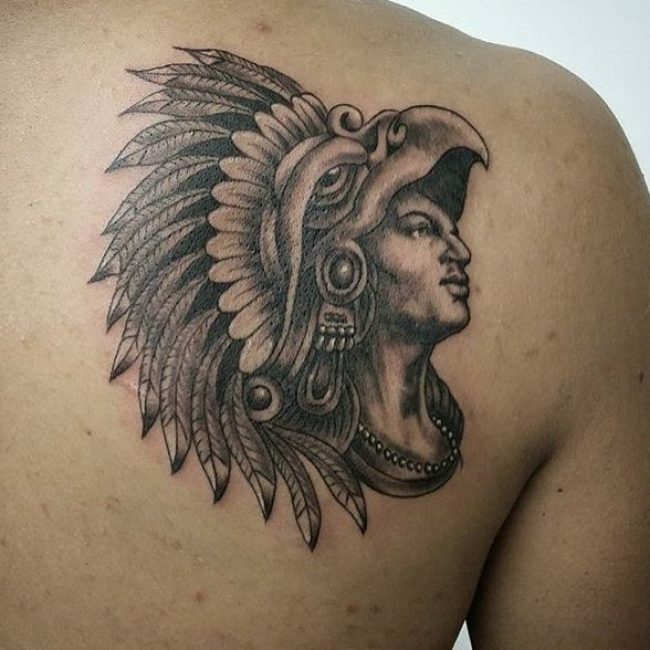 The tattoo defined each member of the tribe and displayed social status. 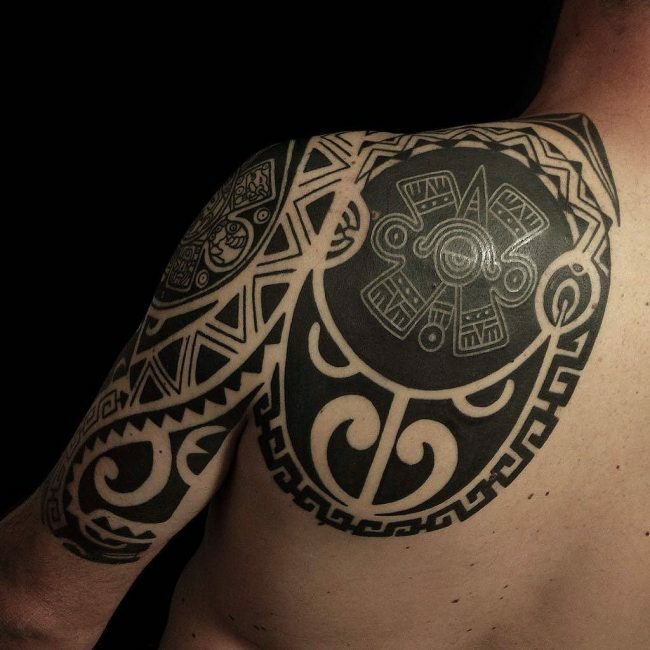 Every tribe used a different type of ink for easy distinction. 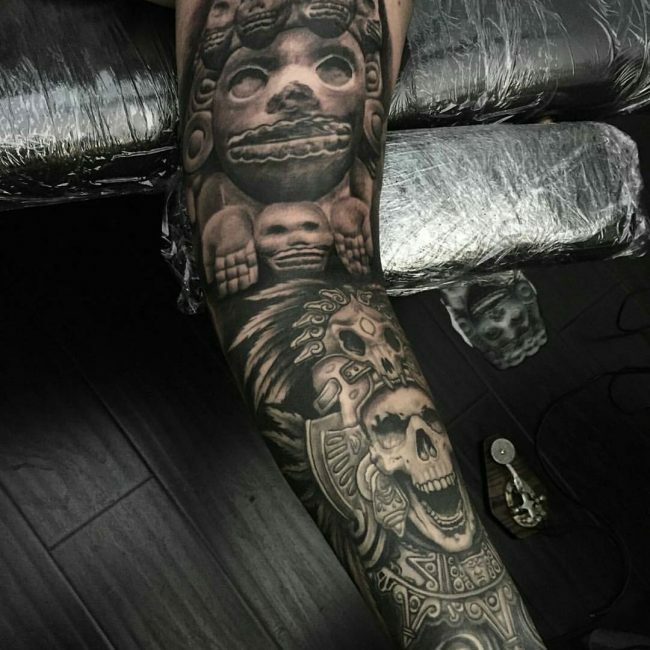 The practice persisted throughout the 15th and 16th century. 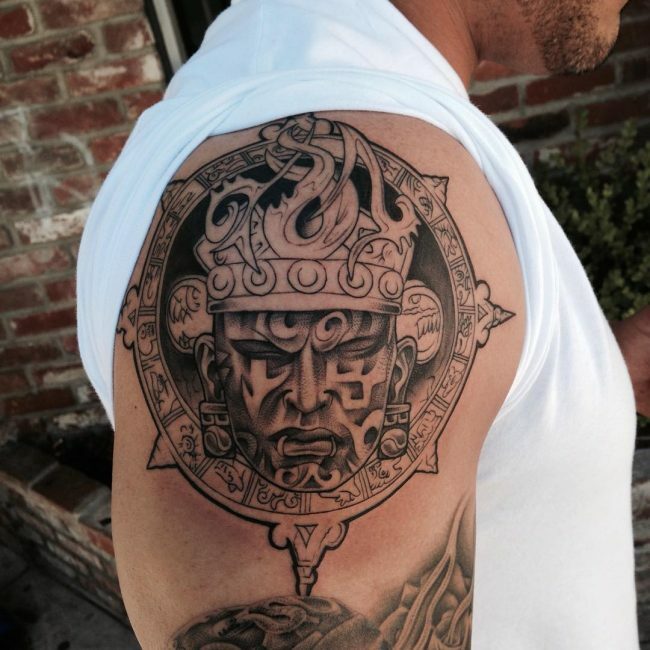 The tattoo was a thing of pride and honor, and was deeply rooted as part of their culture. 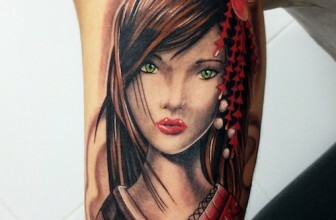 It’s a timeless tattoo who’s popularity is still felt in the modern society. 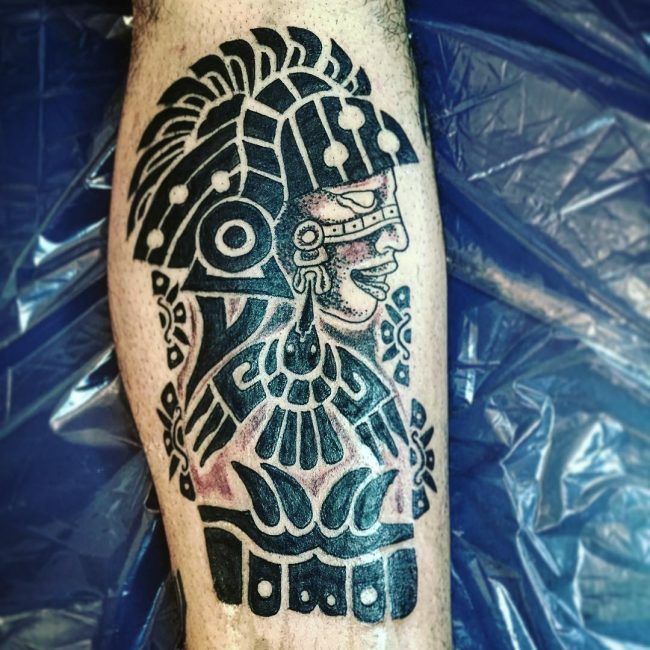 Literally speaking, it has ceased to become a tribal thing. 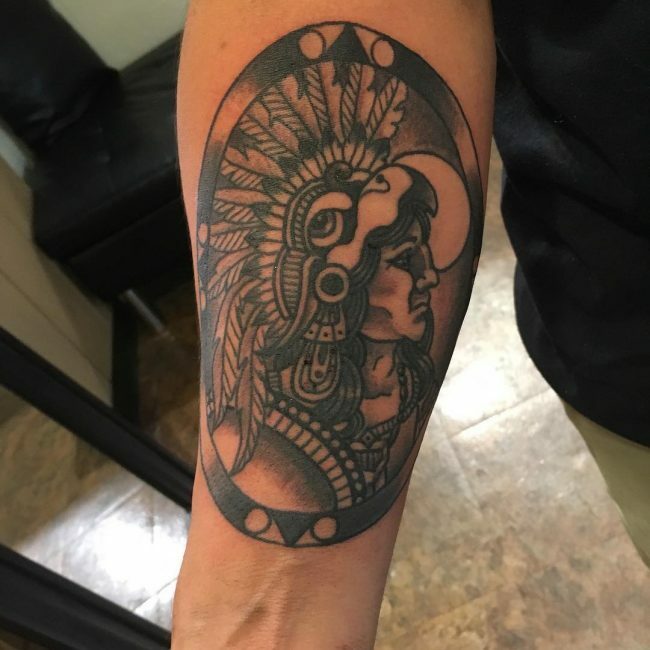 Most men sport it, regardless of their tribe or religion. Celebrities alike have joined the flow. Well, this might be due to the beauty it has to offer or the unique, mysterious look that is quite hard to go unnoticed. 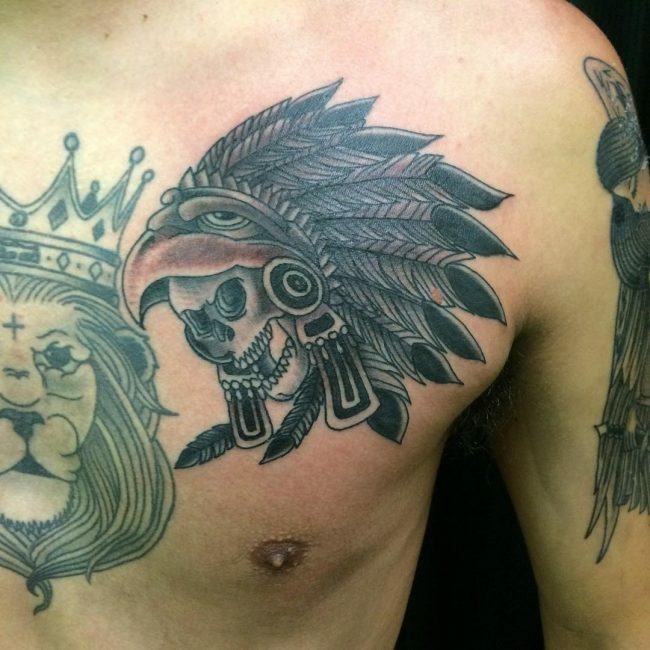 Every tattoo holds a meaning since it results from a choice or ceremony. 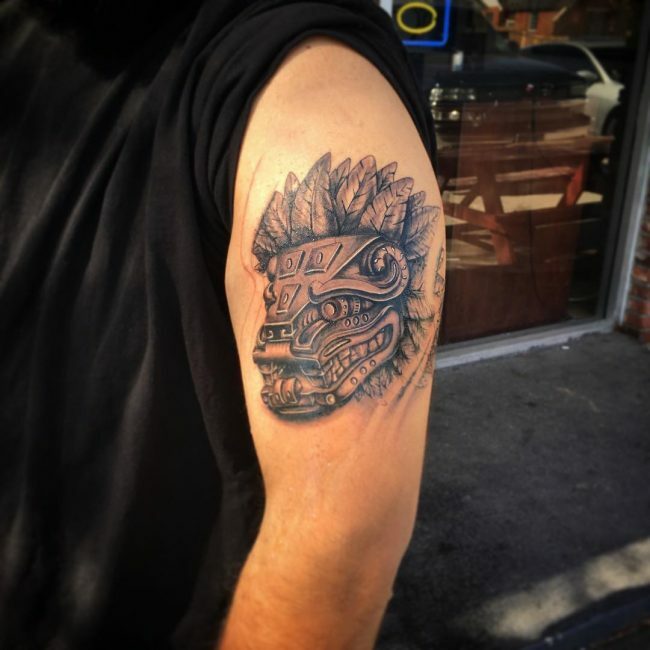 It’s a perfect way of identifying a person or displaying a specific sense of belonging. It communicates something to someone and is part of our material self. 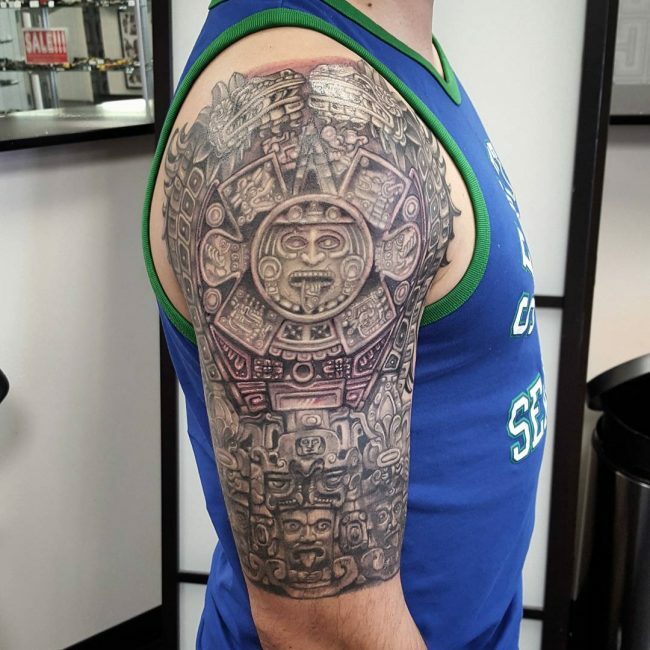 The Aztec tattoo is no exception. It comes in many different types that hold different meanings. Let’s take a look at them. 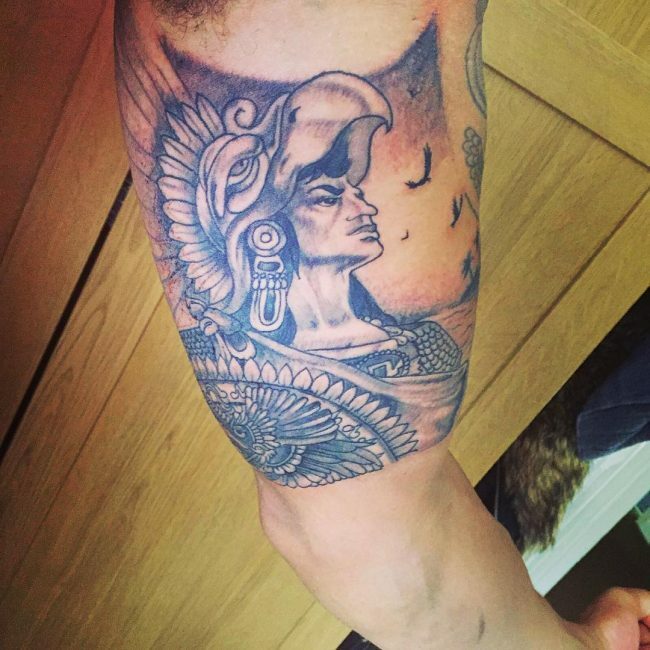 Eagle Aztec: This type of tattoo depicts a person sporting the traditional warrior costume. 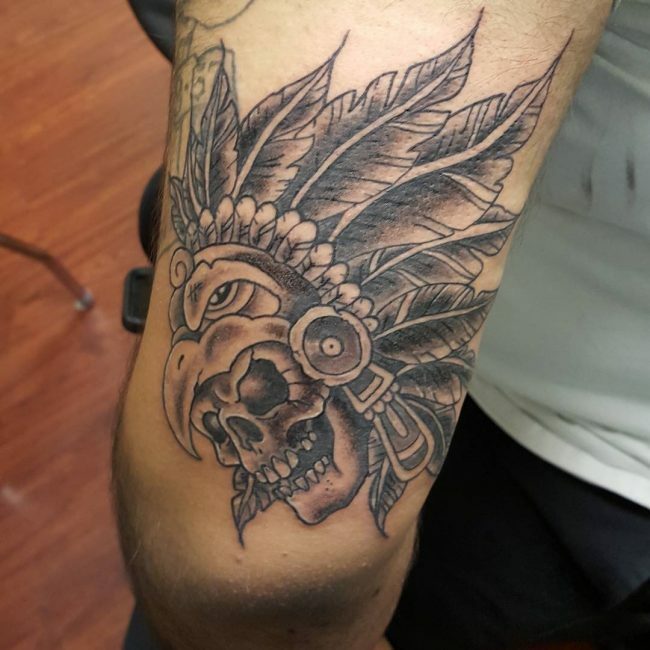 The headdress sports a feathered design with a large beak that comes over the top. 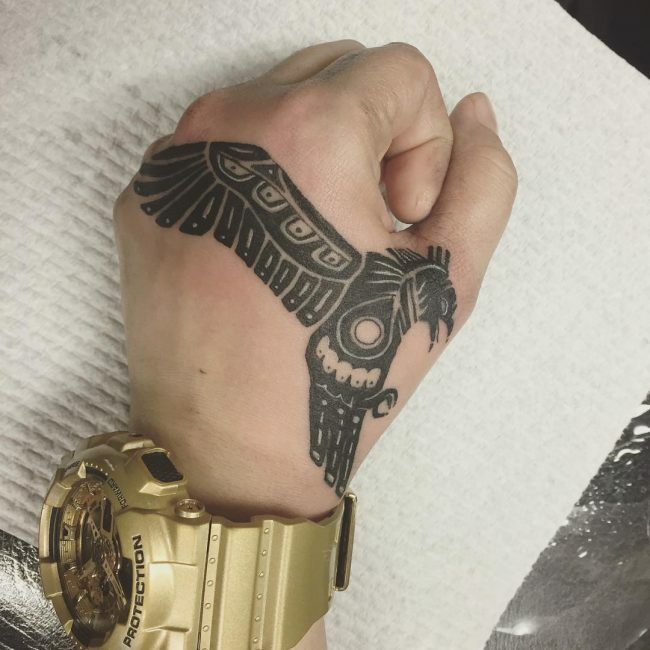 The beak ends in front of the forehead to create that eagle look. 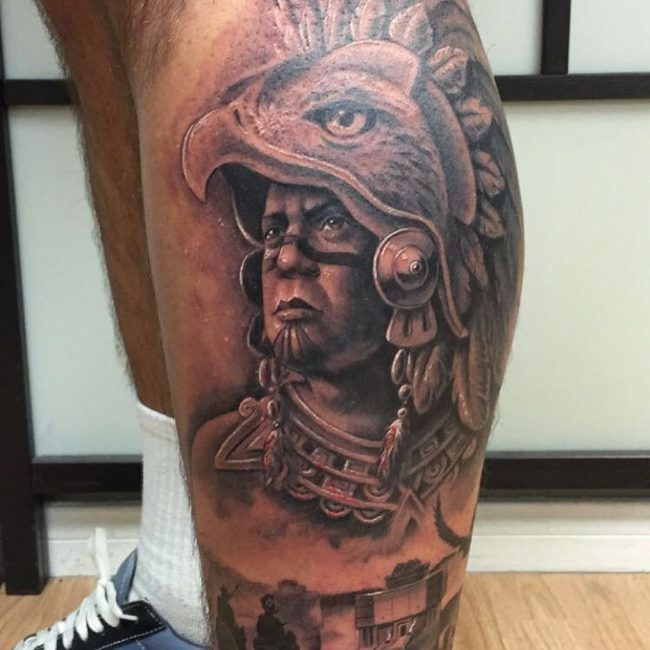 The eagle is revered to be a high ranking warrior in the animal kingdom. 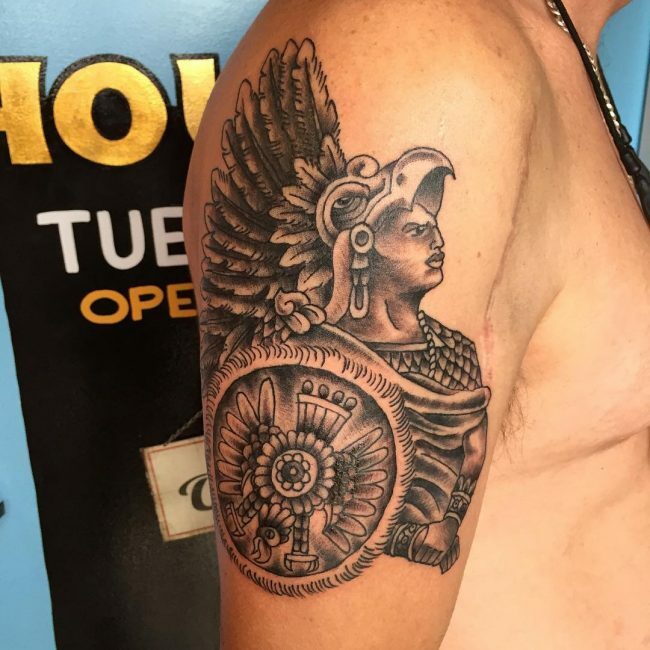 It’s symbolic to the west and it’s also a God. 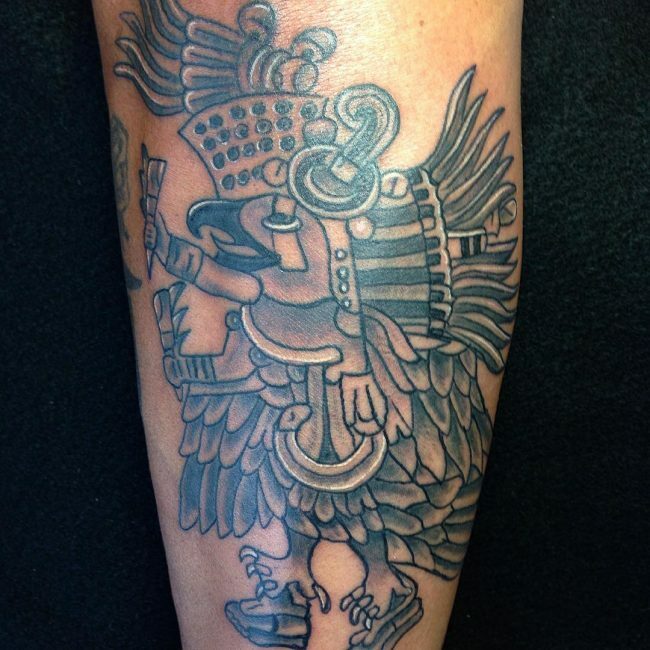 The eagle represents the 15th day in the Aztec calendar. 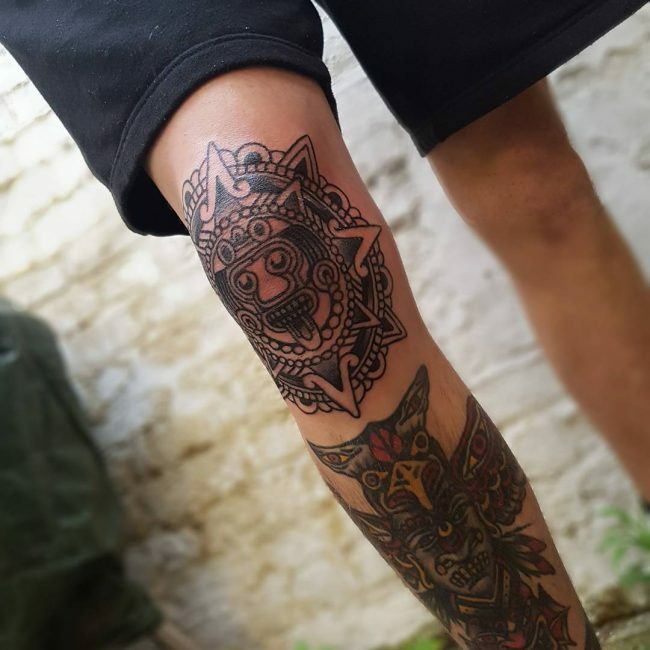 Flower Aztec: Just as the eagle is symbolic to the 15th day of the Aztec calendar, the Aztec flower is symbolic to the 20th day. 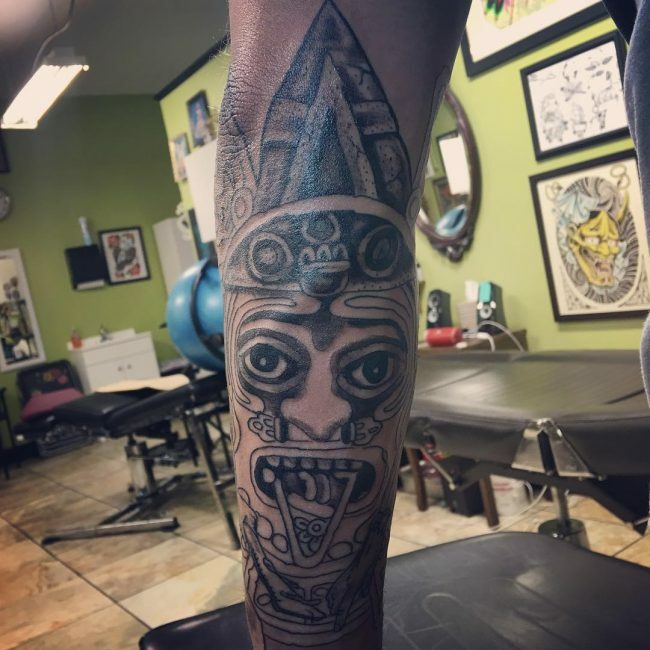 It’s symbolic to a deity and represents the south. 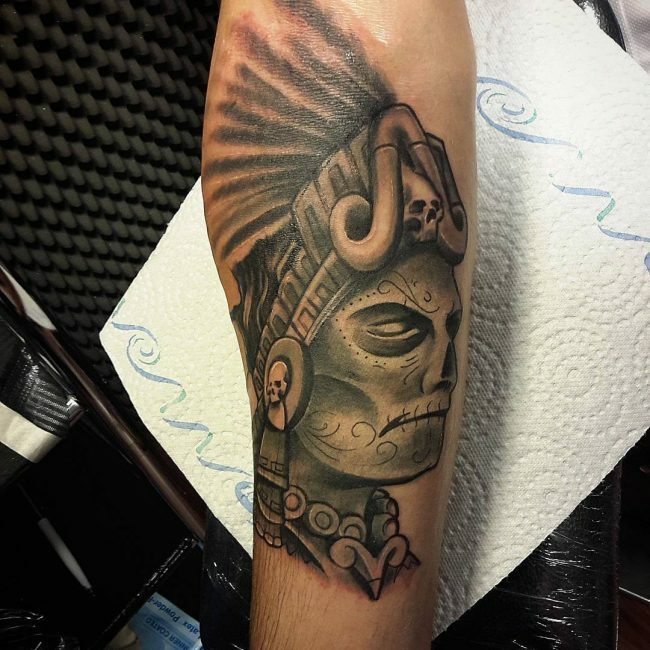 Skull Aztec: This tattoo represents the 6th day. 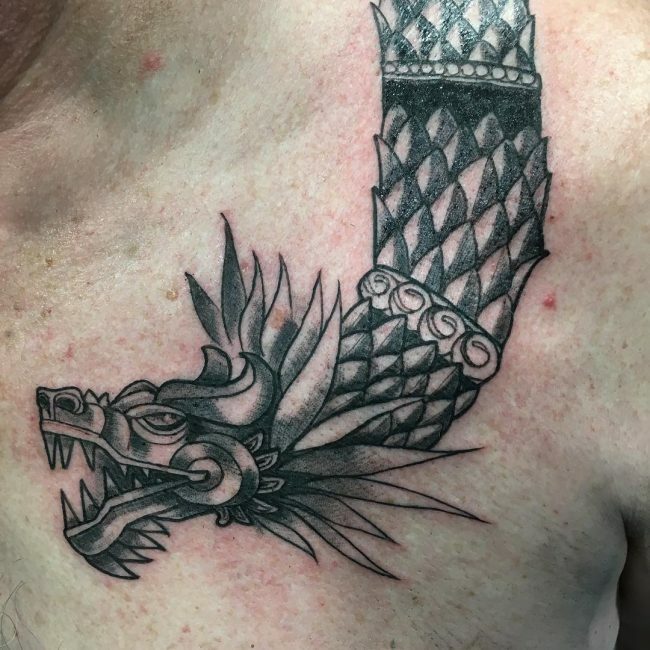 It represents the north and signifies death. 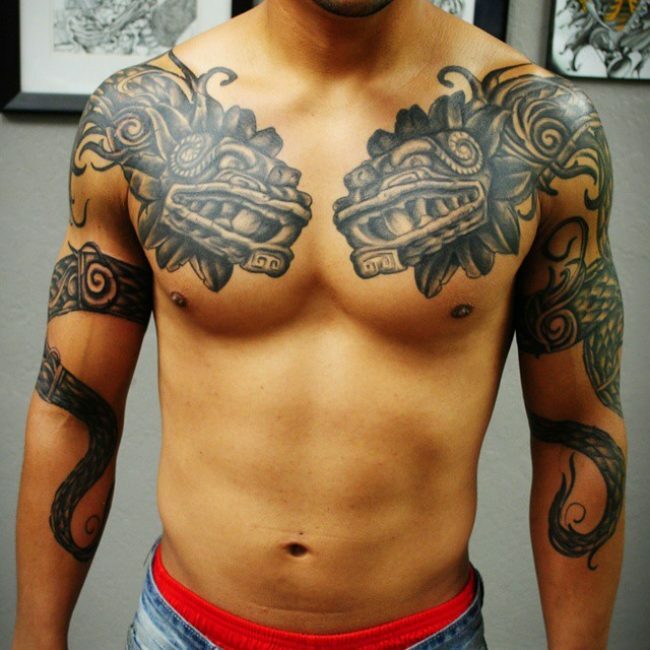 They are one of the most popular tattoos sported by men across the world. 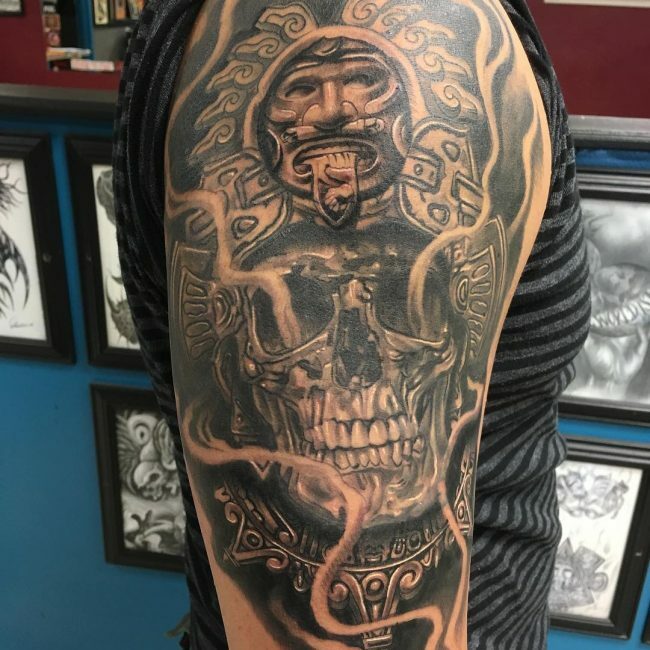 You can include your heritage to make it stand out. 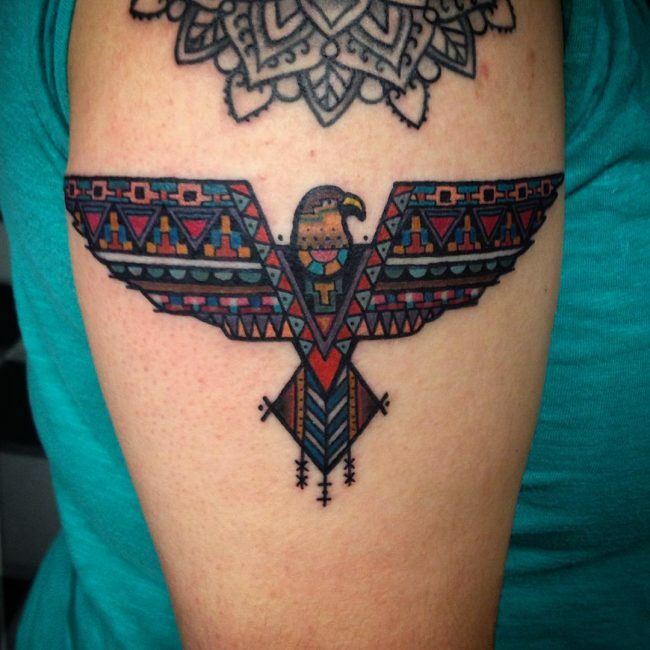 Bird Aztec: This tattoo includes two birds – the eagle and vulture. 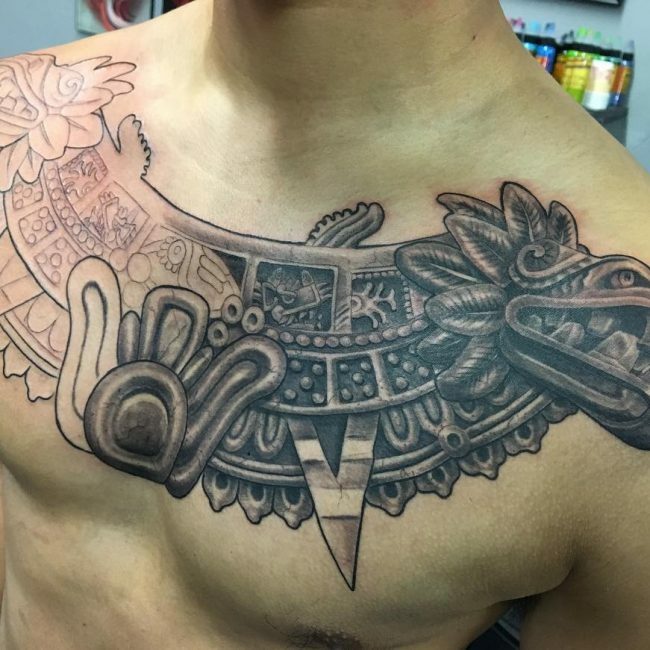 The birds represent the gods, warriors and are part of the Aztec calendar. You have the option of choosing between the two birds. 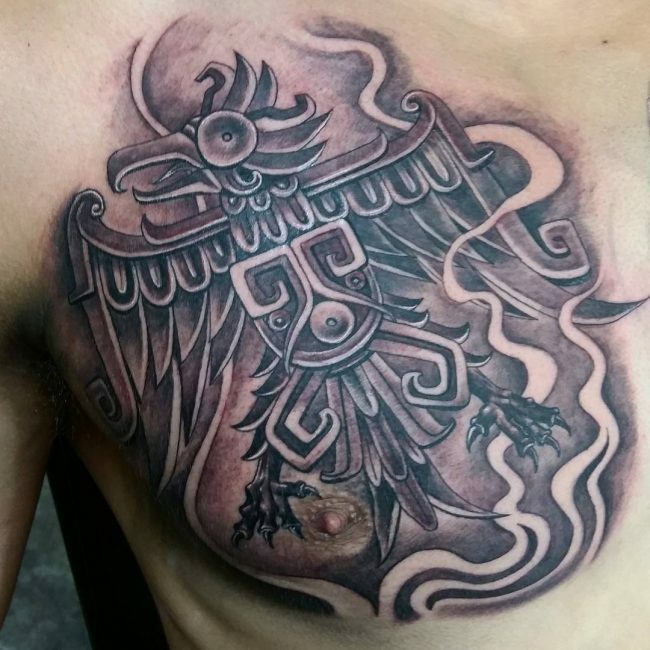 The awesome vulture represents the south and the 16th day of the calendar. 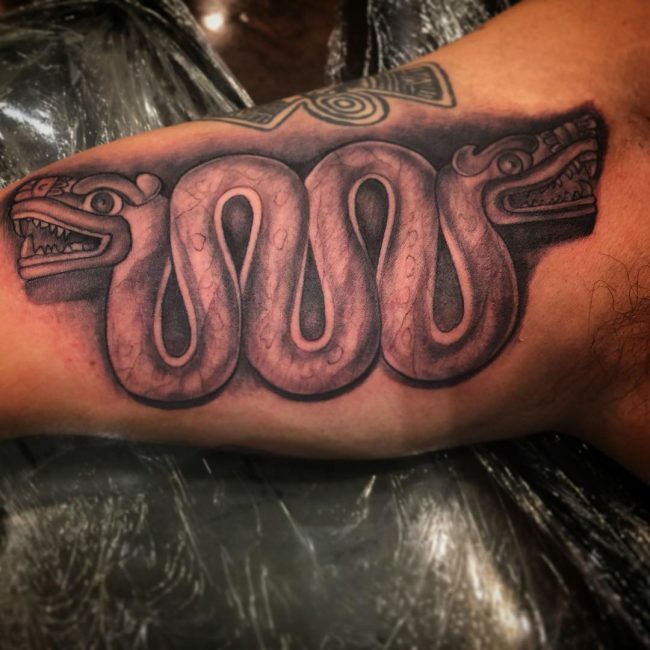 Serpent Aztec: This is a representation of the snake god or serpent. 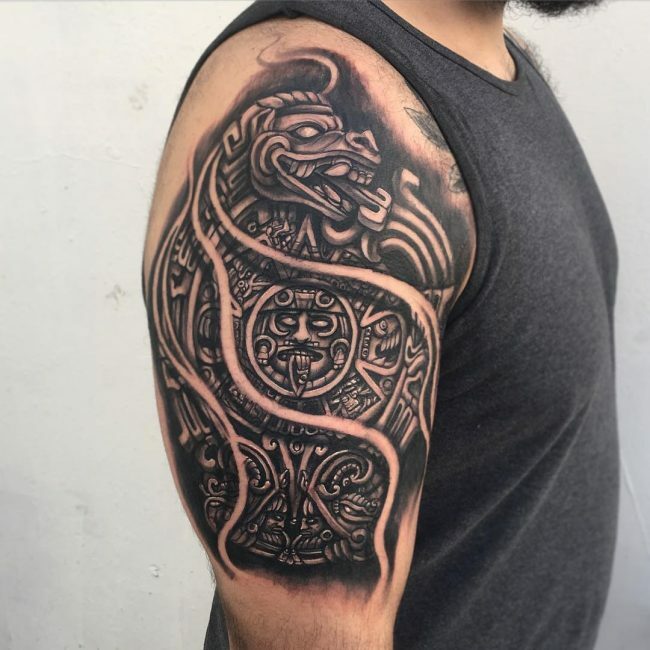 The serpent represents the east and the 5th day of the calendar. 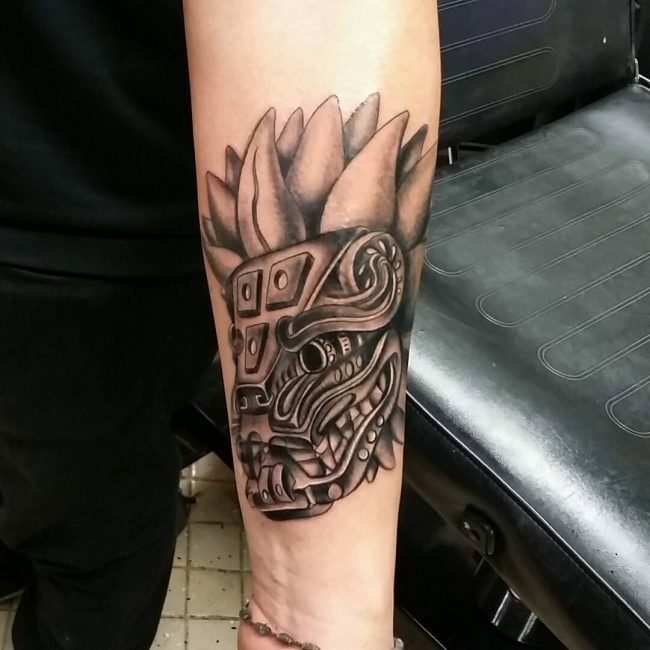 Warrior Aztec: Warrior Aztec is full of possibilities. 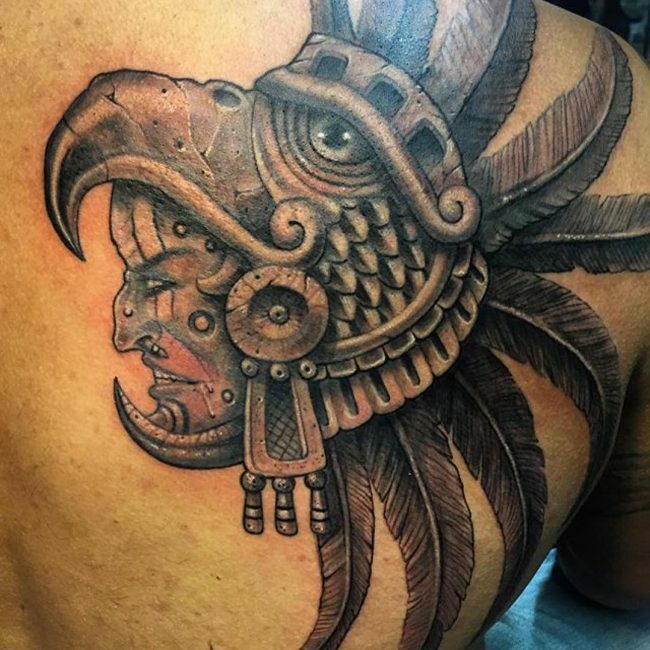 You can choose from eagle, jaguar, shields, weapons or human costumes. Note that the higher ranking warrior calls for an artistically elaborate costume and gear. 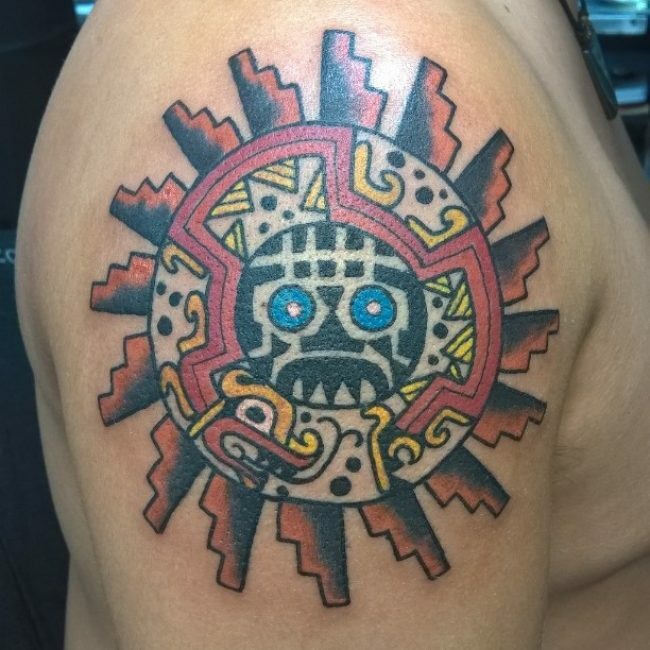 Sun Aztec: This tattoo holds a very special meaning. 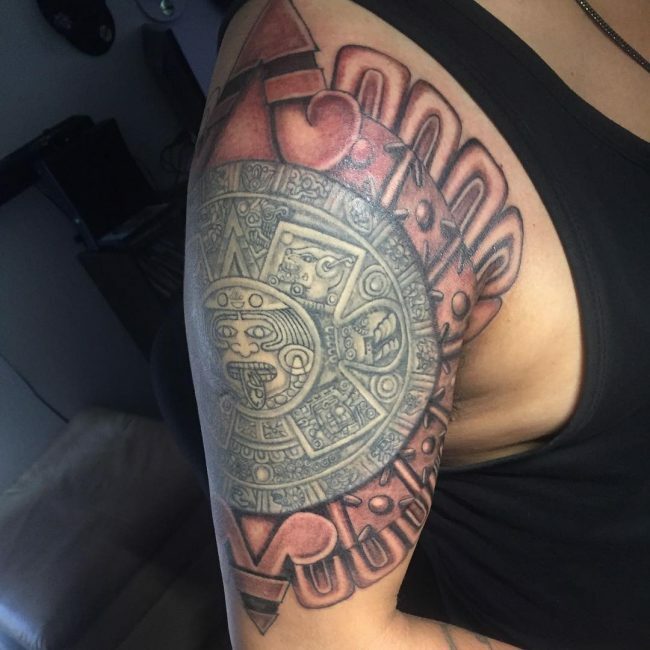 It’s symbolic to the world or universe, including its inhabitants and species. 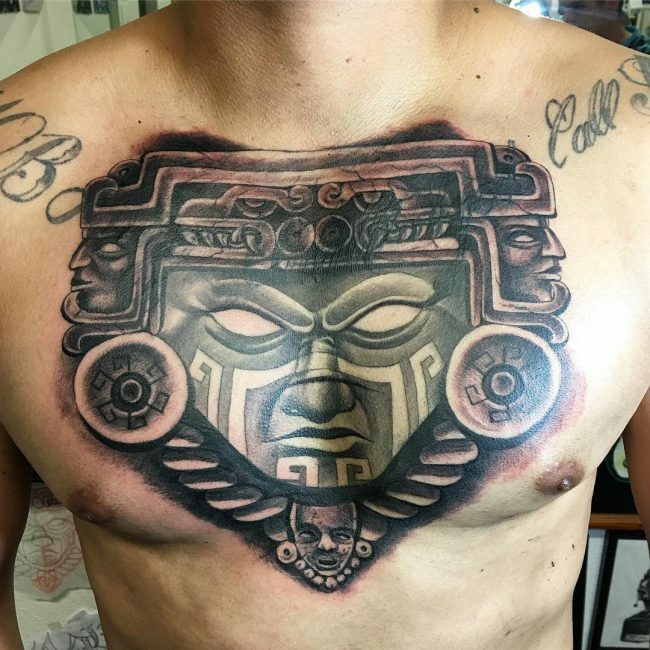 This Aztec world lasted 52 years. 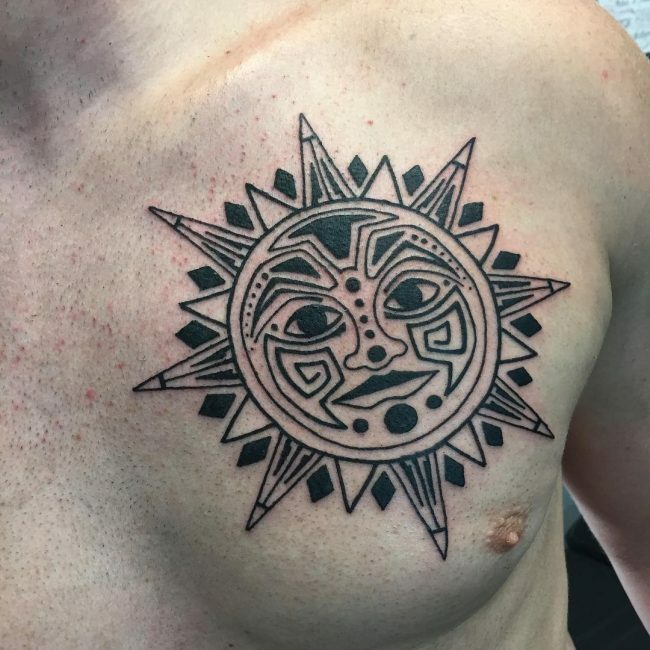 Sun God: This tattoo is among the most requested. 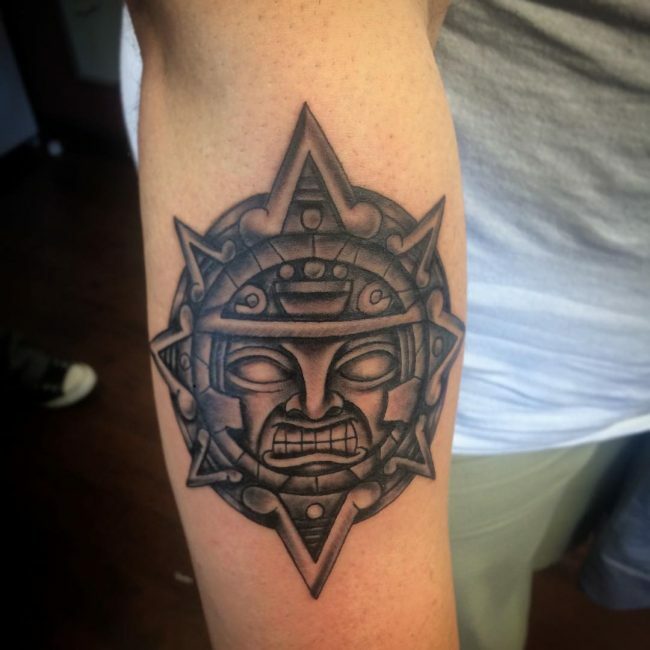 However, it’s quite fascinating that the Aztec tribes didn’t have a Sun God. 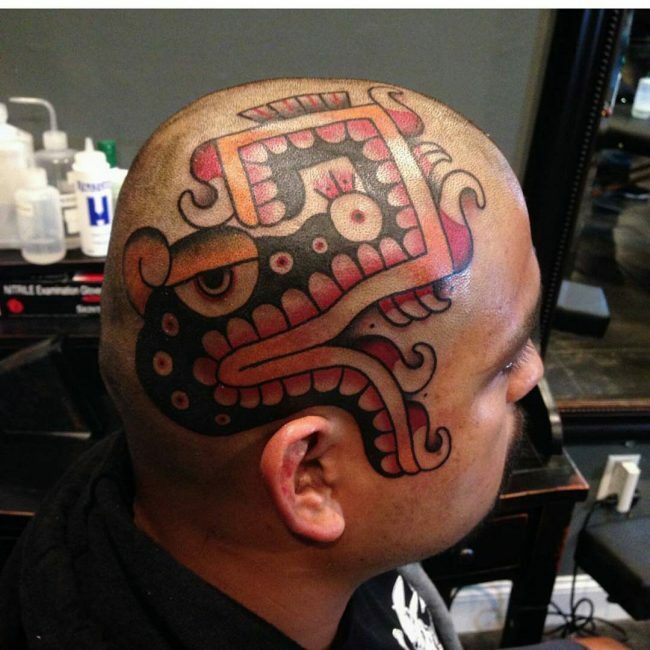 But then, they did have a God that represented the sun and other things. 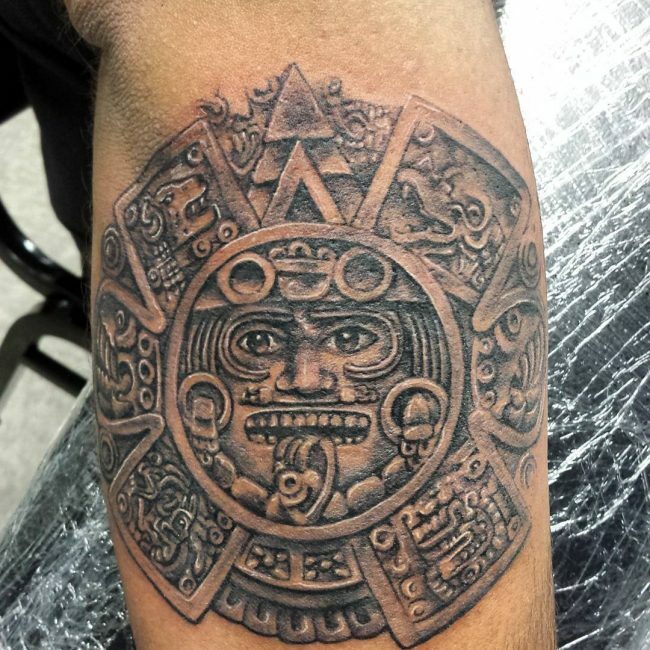 It’s an awesome tattoo that sometimes signify a lowly god that sacrificed himself to become the sun. 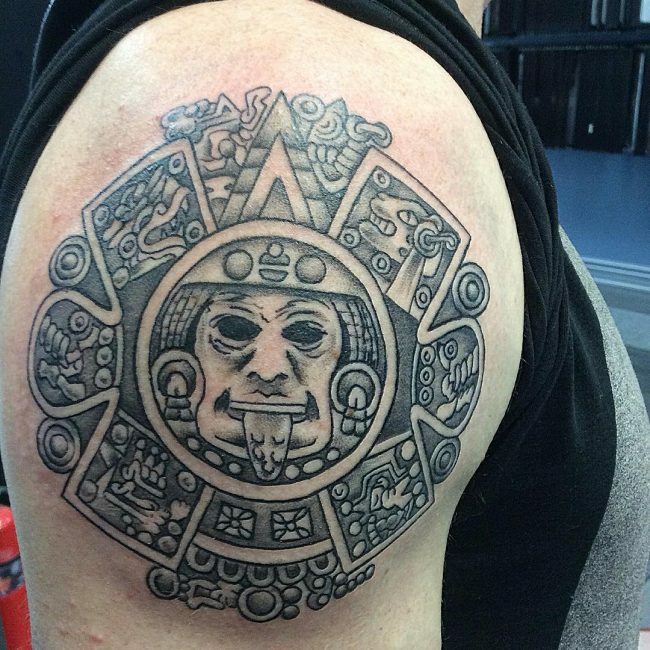 Moon Aztec: This tattoo is similar to the sun, but minus the 52 years that mark the periods of the worlds. 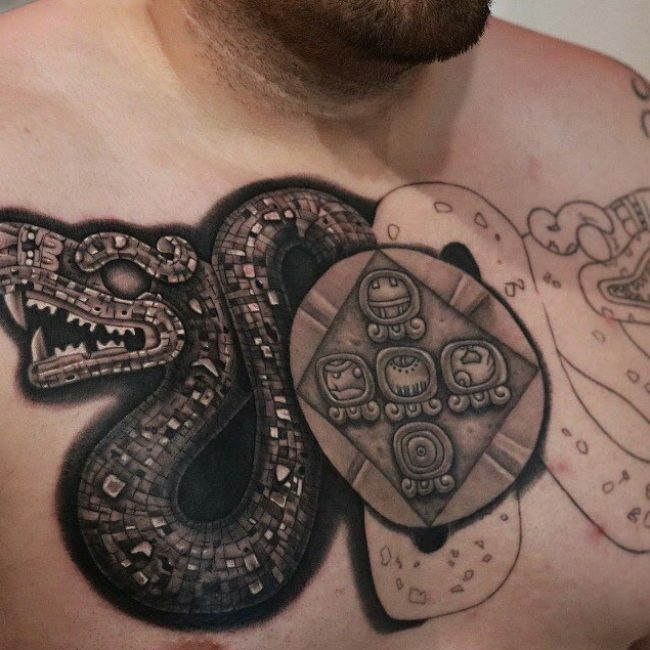 That tattoo has turn out to be a difficult subject. 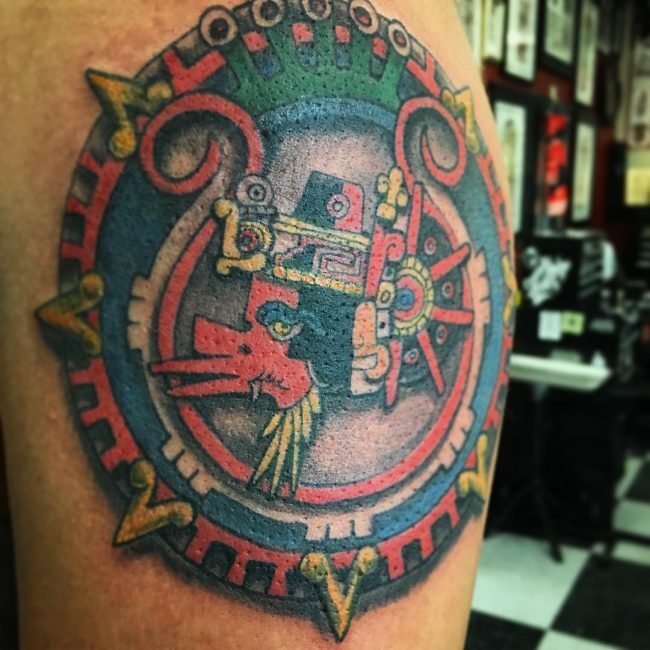 It represents Metztli – a lowly god that failed to sacrifice himself. 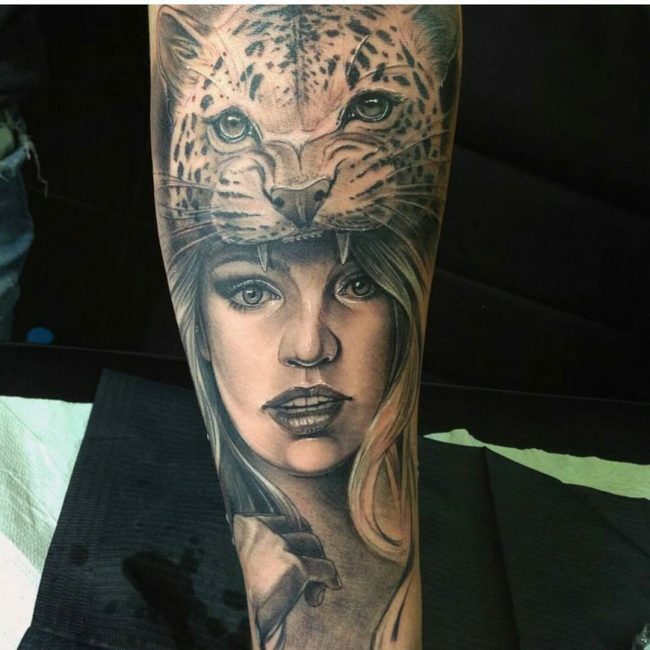 This tattoo looks fabulous, especially when put on the sleeve. 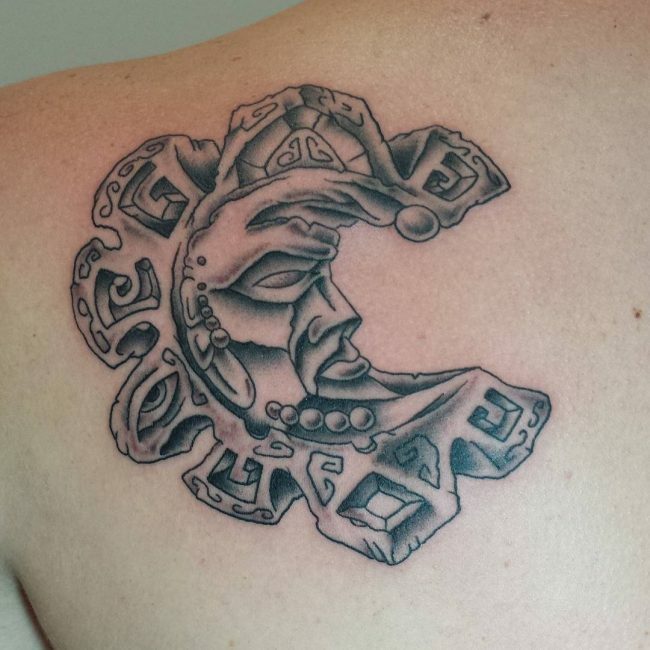 It portrays a pictographic language of how the moon came into existence. 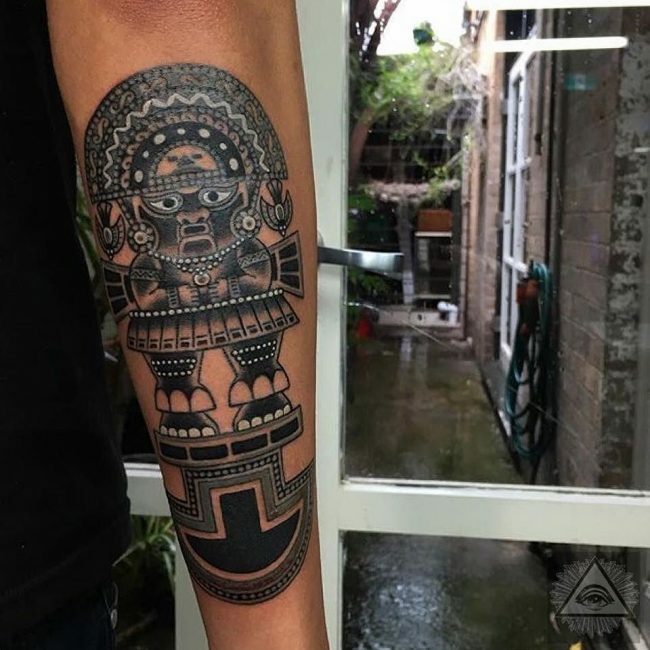 God Aztec: The Aztec had numerous gods and goddesses. 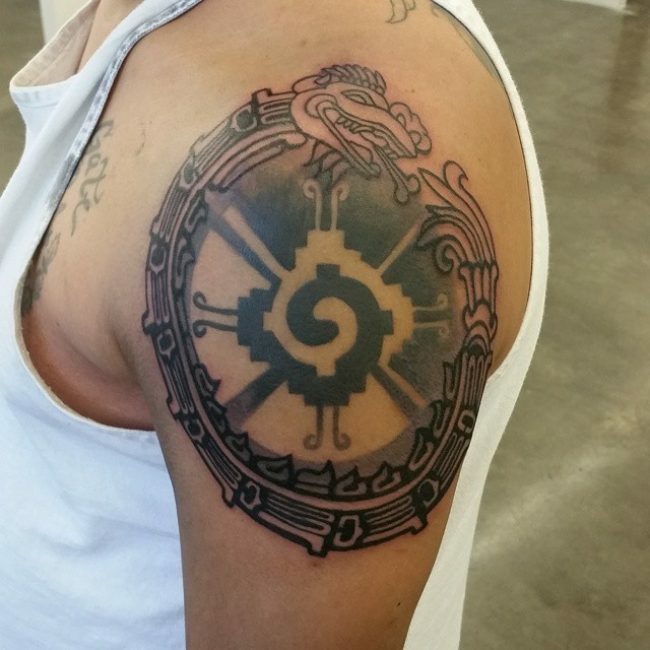 There is the Skybearer group that supports the sky and represents south, north, east, west. 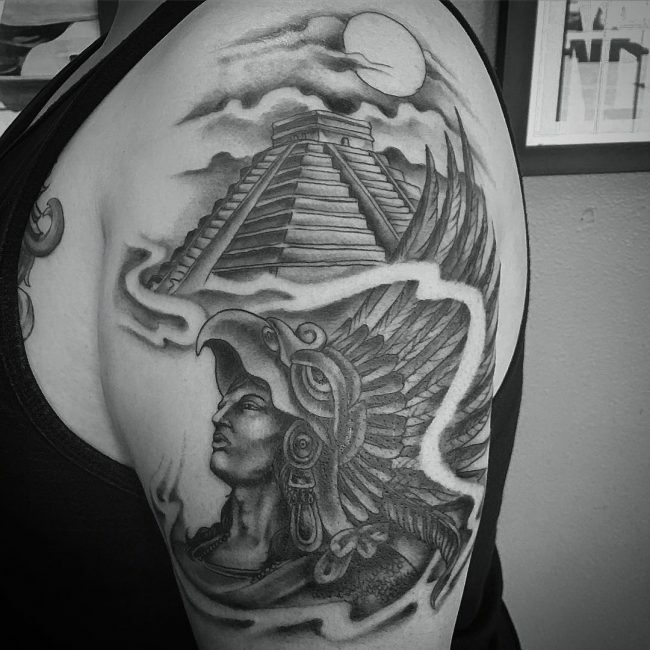 The Cihuateteo is a group of goddesses that died in childbirth. These goddesses had positive and negative duties and their images were often accompanied by warriors in battle. 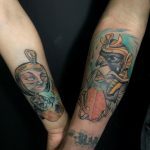 In the modern-day society, the different meanings of these tattoos are taken into account during the tattooing process. 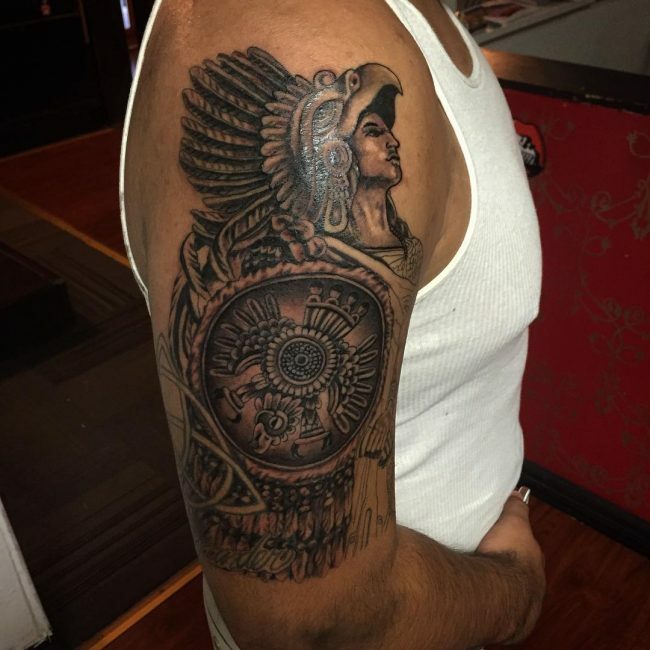 However, those that do so are much aware of the meanings and the link to their heritage. 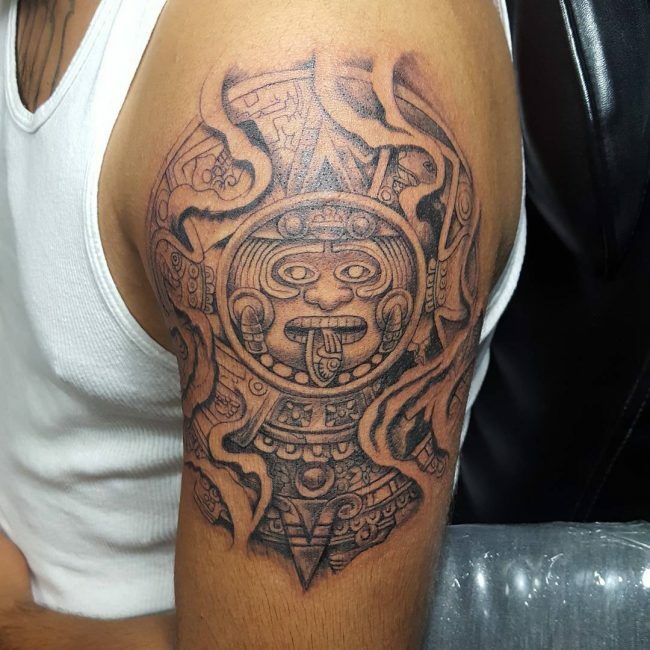 Colors may vary depending on your personal preferences, but the tribal symbols are usually done in black ink. 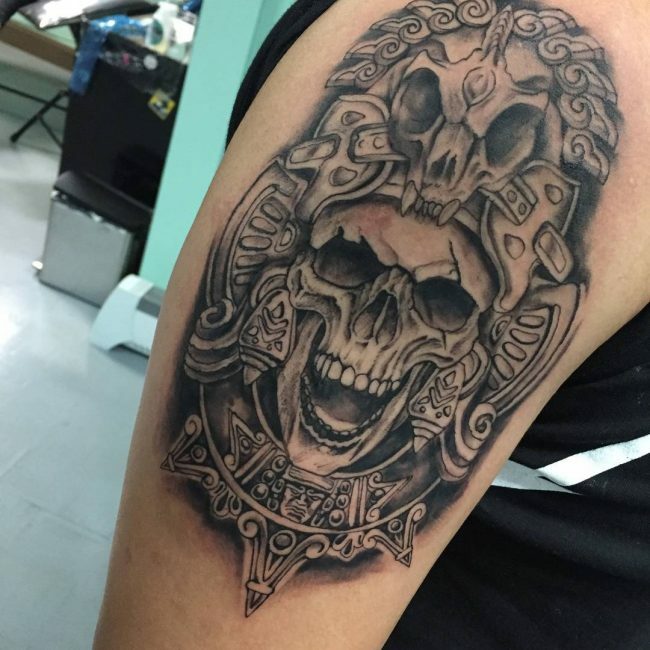 You may choose to customize your tattoo and make it unique without compromising the original meaning. 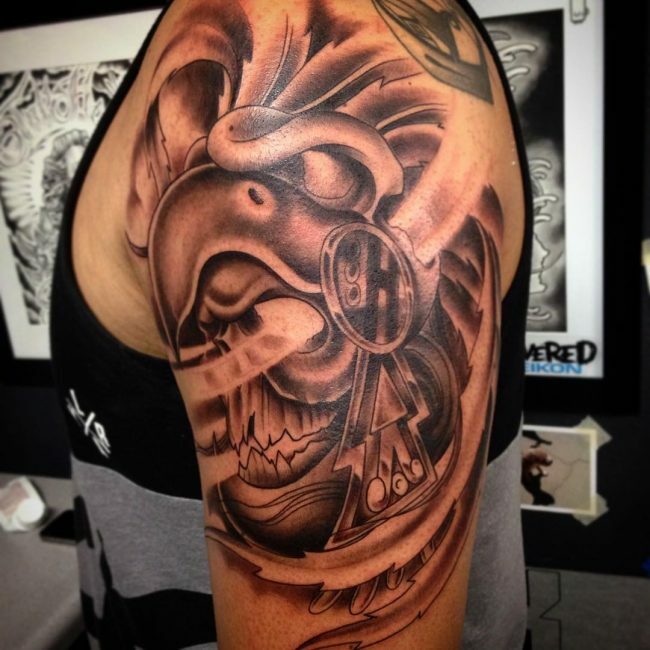 Outlining: Lining is the basic part of the tattooing process and is done during the first stages. 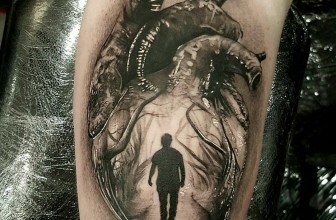 It involves creating a basic sketch using needles. 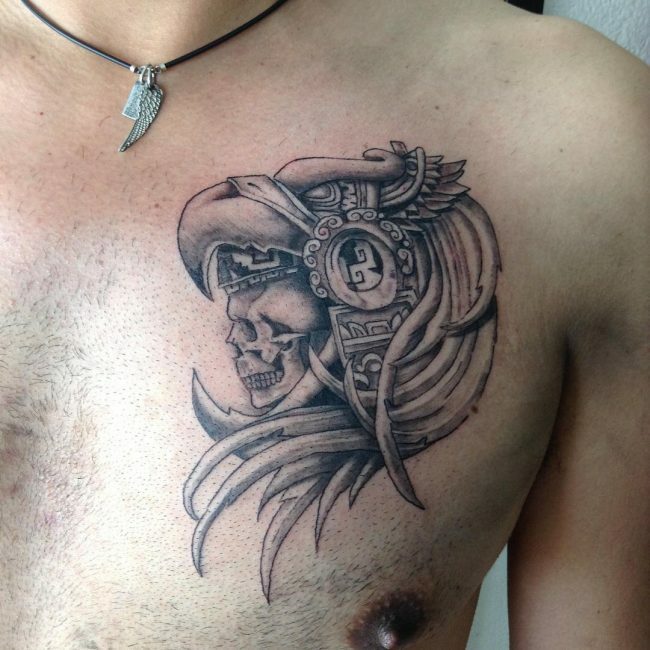 You can sketch the symbol you prefer using thin or thick lines as per your taste. 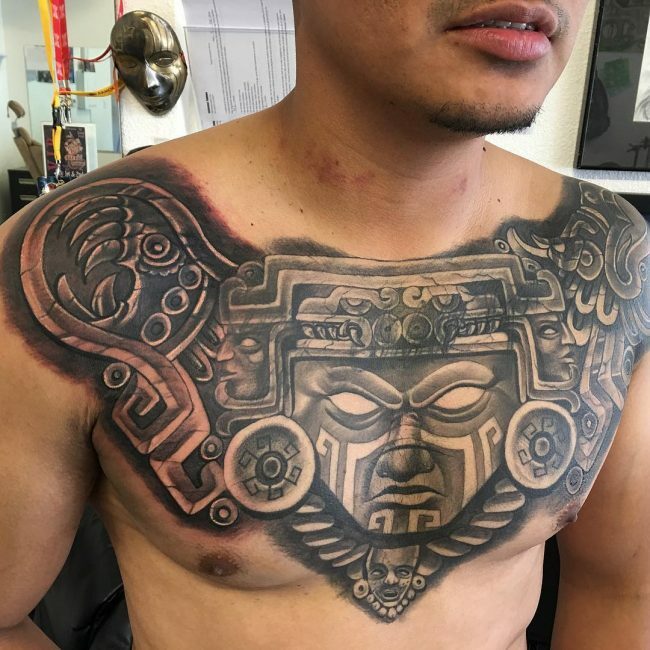 This forms a foundation to designing the tattoo. 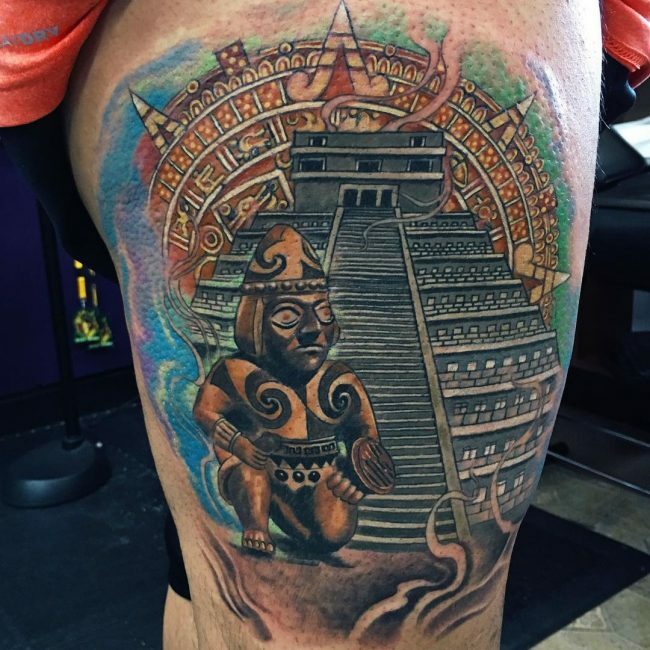 Coloring: The Aztec type of tattoo is a stunning and vibrant option that needs some color to go with. 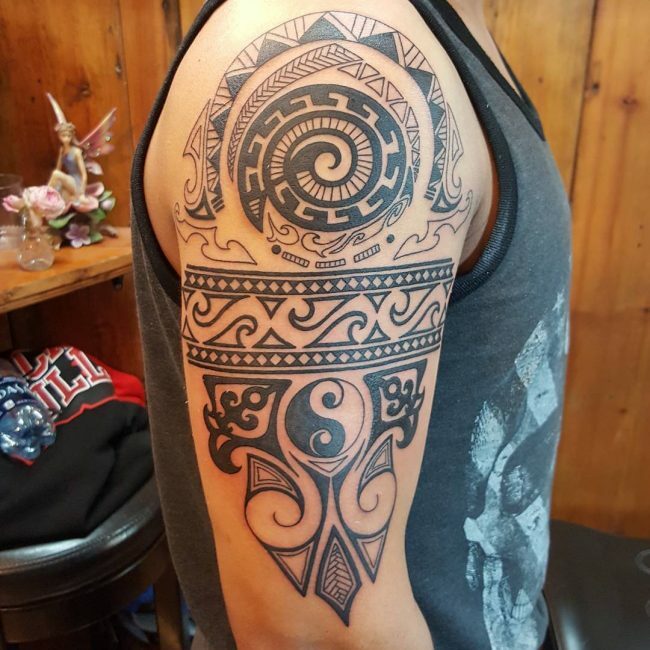 Therefore you need to use color, not unless you prefer the tribal type of the tattoo. 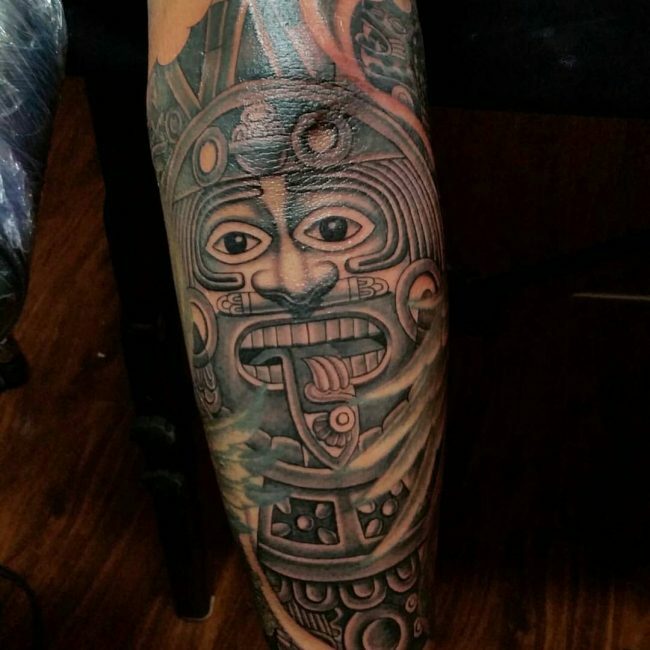 And considering the fact that Aztec artists were quite prolific, the coloring should be done with a lot of care. 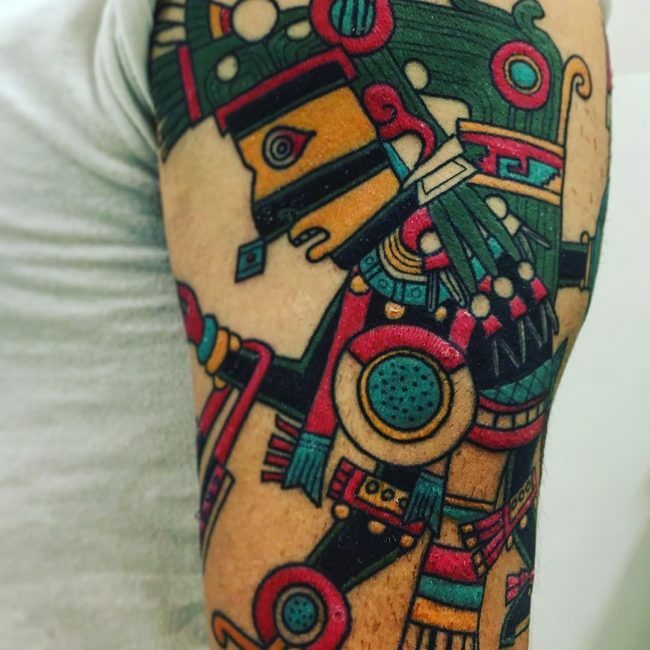 This tattoo requires a lot of color and it will be better to stick with the images on record to produce something authentic. 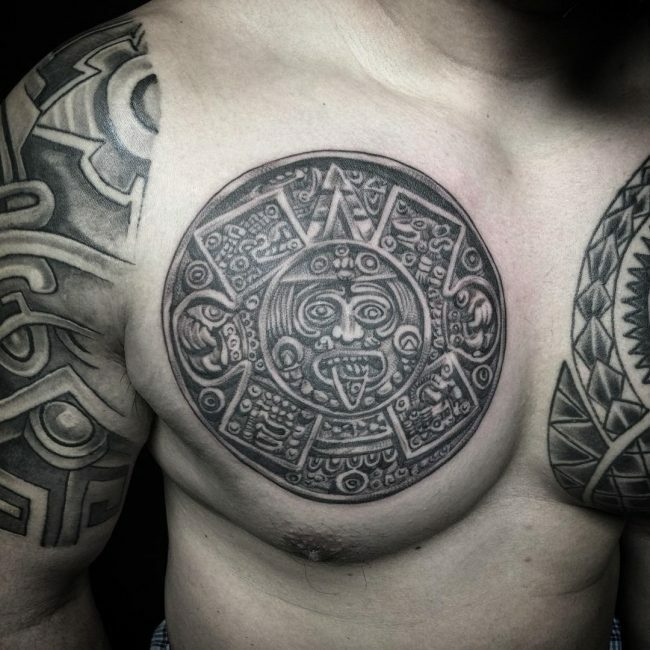 The beauty of the Aztec tattoo is that there is always a size and shape for every person. Size is important, especially when you’re looking for a meaning. 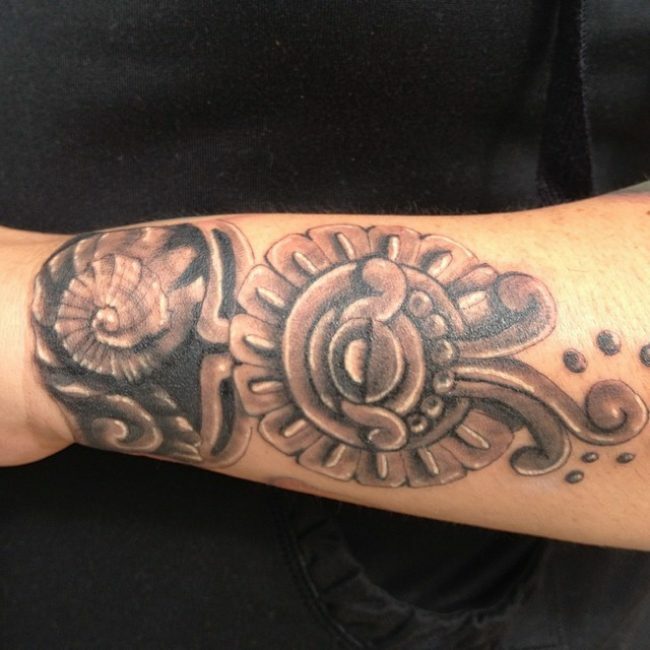 Therefore, upon choosing your Aztec symbol, it would be better to first decide on the size of your design. 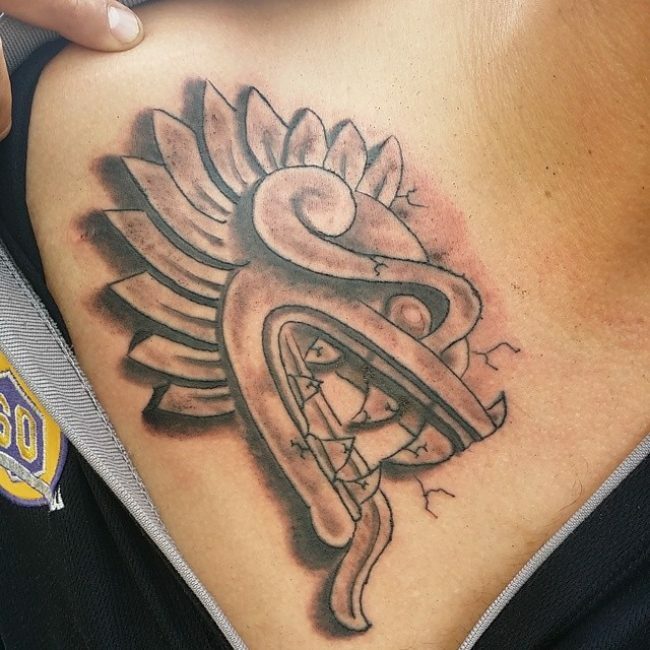 And in case the meaning holds much importance to you, put it in a place where it’s visible. 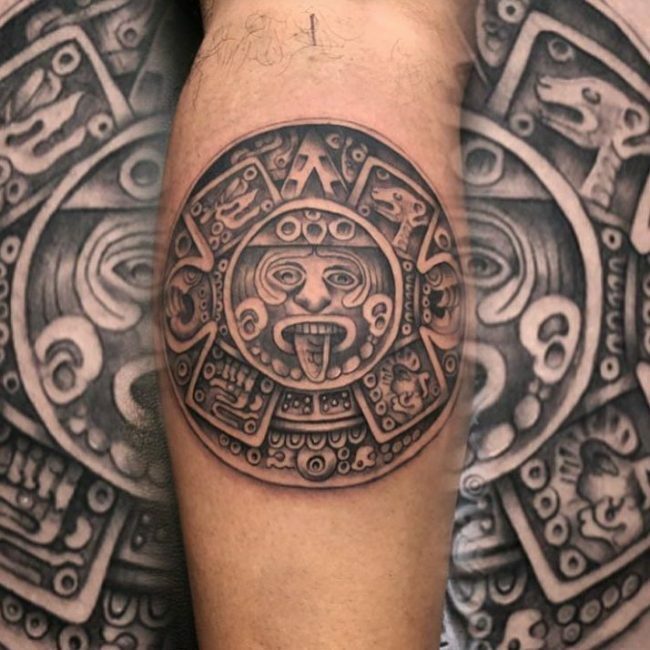 Make a careful consideration when choosing Aztec calendar tattoos. 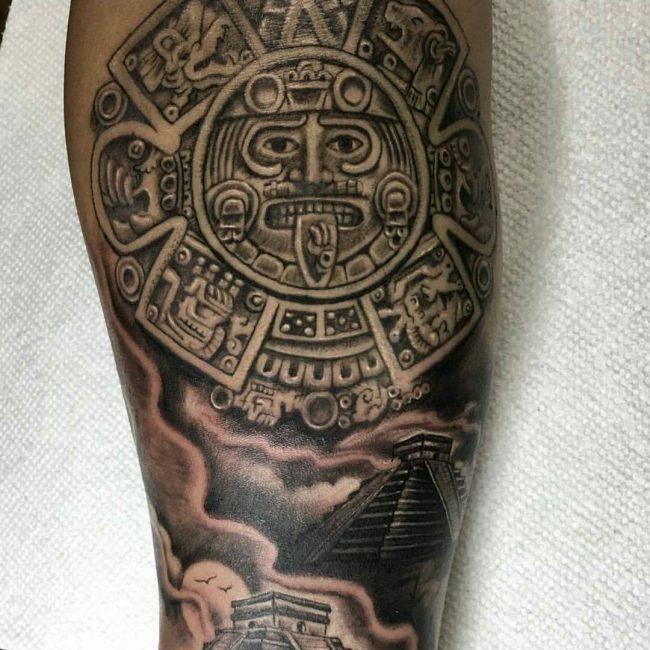 This type of tattoo requires lots of space. 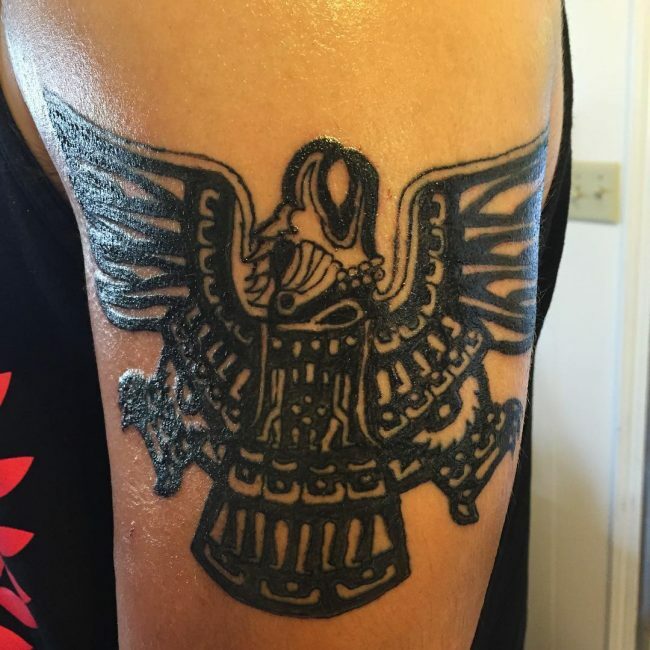 It’s recommended that you put it to cover the entire back to for more impact. 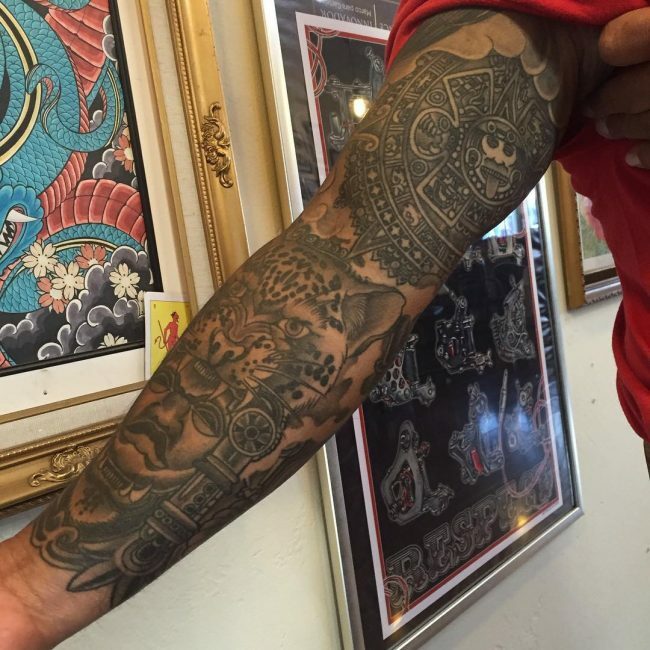 You can also choose to wear the tattoo on the biceps, where the space is quite plenty. 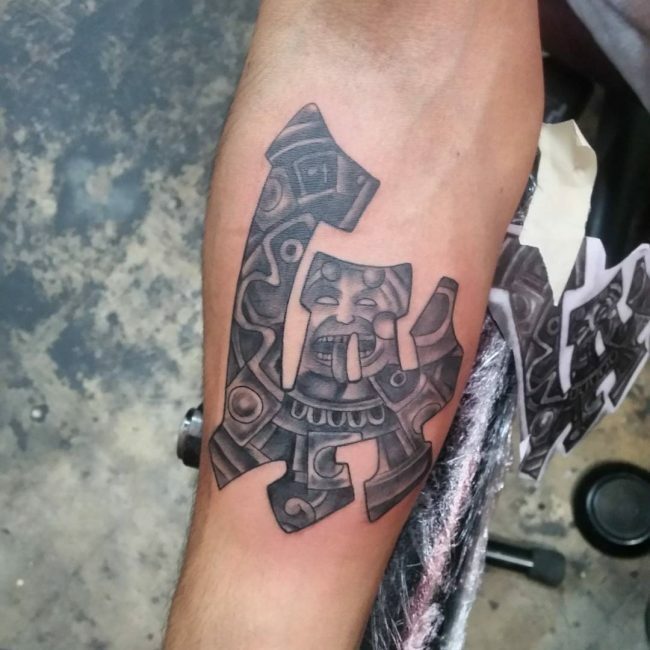 Other tattoos can be scaled to a much smaller size. 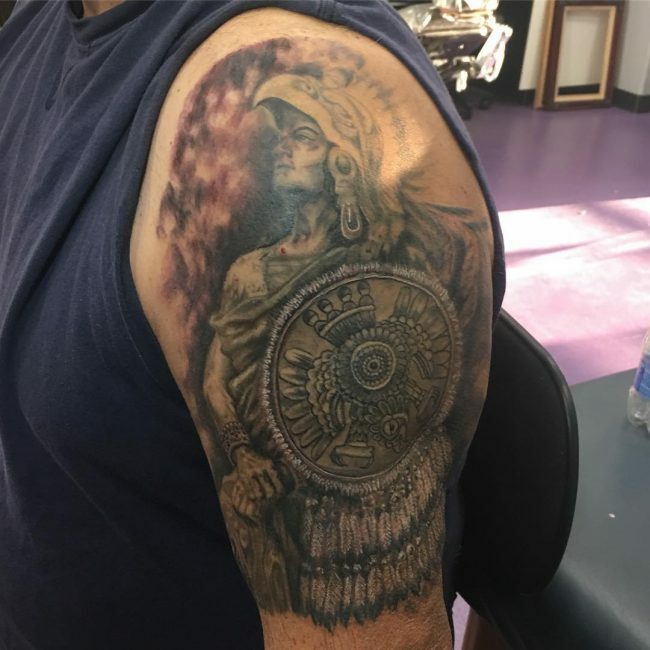 This includes the sun and eagle tattoos. 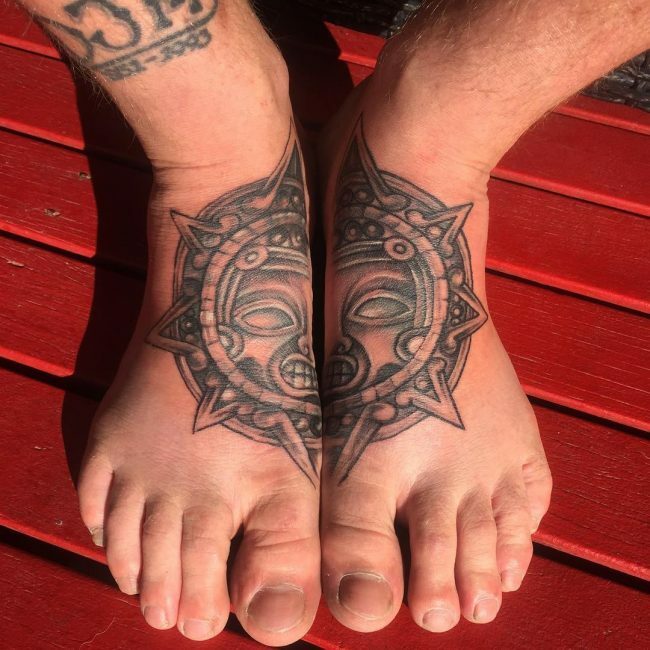 They provide a perfect fit on the wrist and ankle. 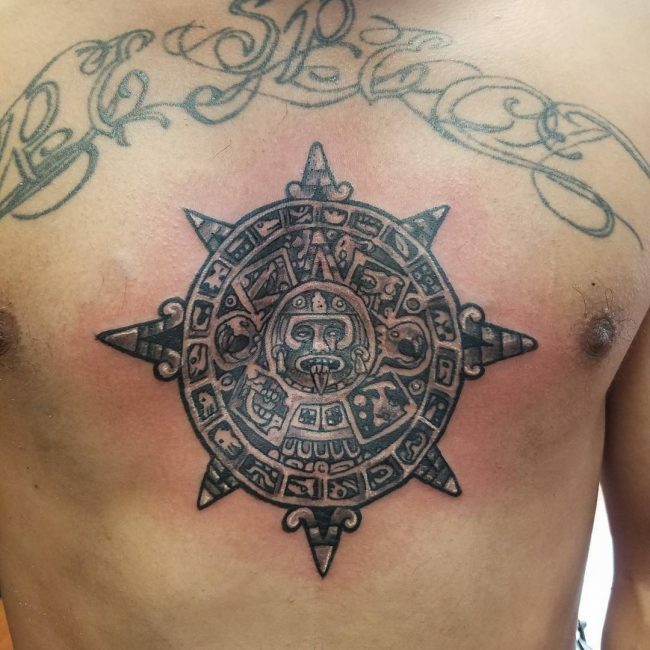 And in case your symbol represents a certain commitment to a god, then it’s best to wear it on the chest, wrist or stomach. 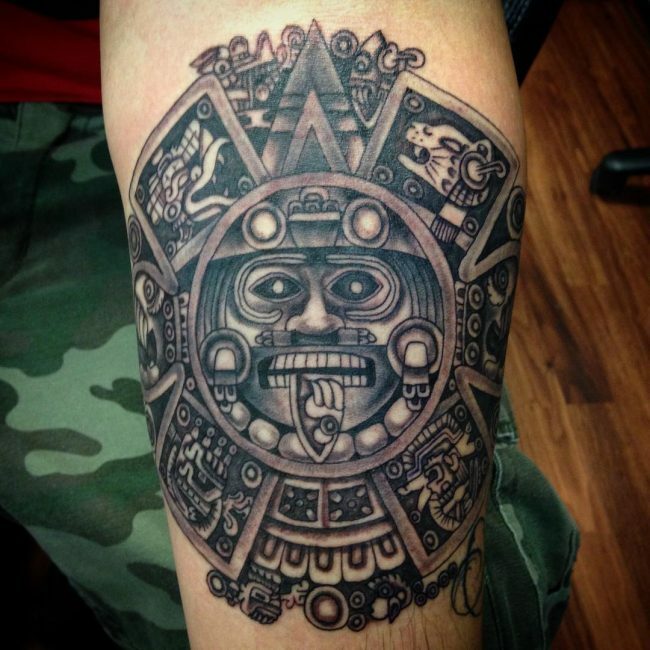 The Aztec tattoo is among the most outstanding ancient artistry. 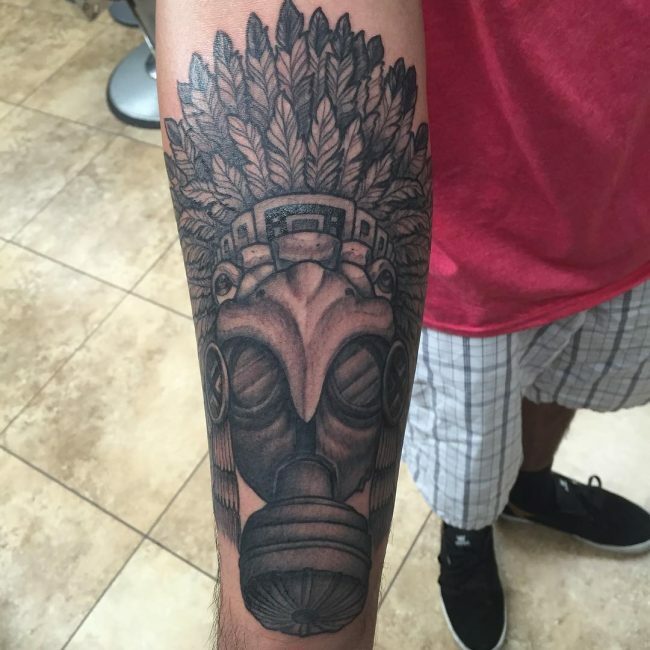 This tattoo provides a great way of identifying with culture or appreciating creativity. 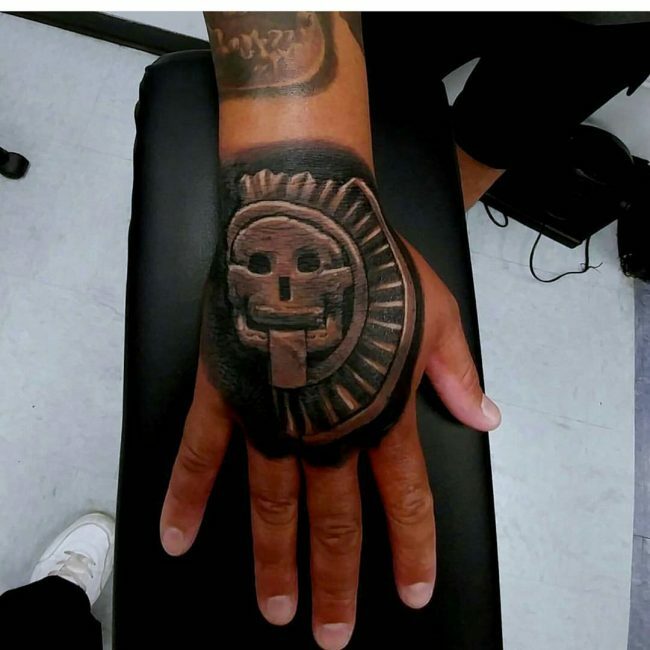 Just by possessing this ancient tattoo, you get that uniqueness that is hard to go unnoticed. 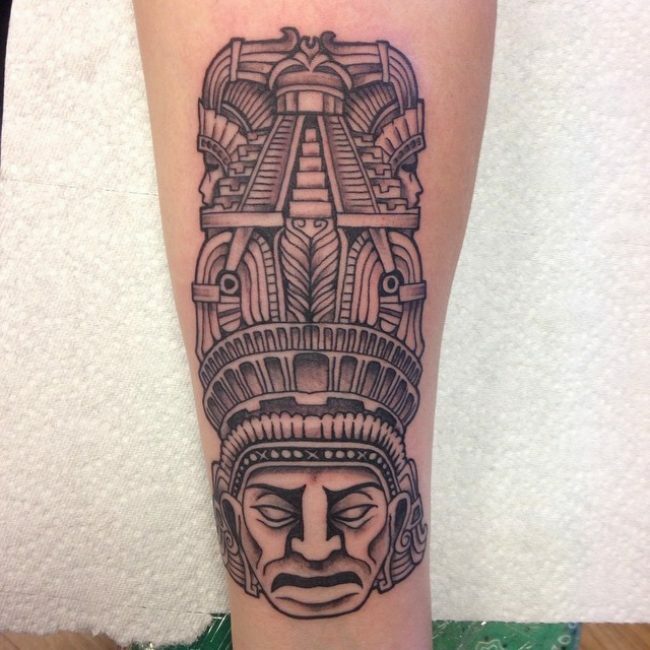 This rare collection is a perfect way of going ancient in style. 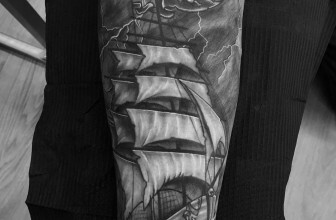 However, you must be prepared for a pretty long tattooing session due to its complexity.